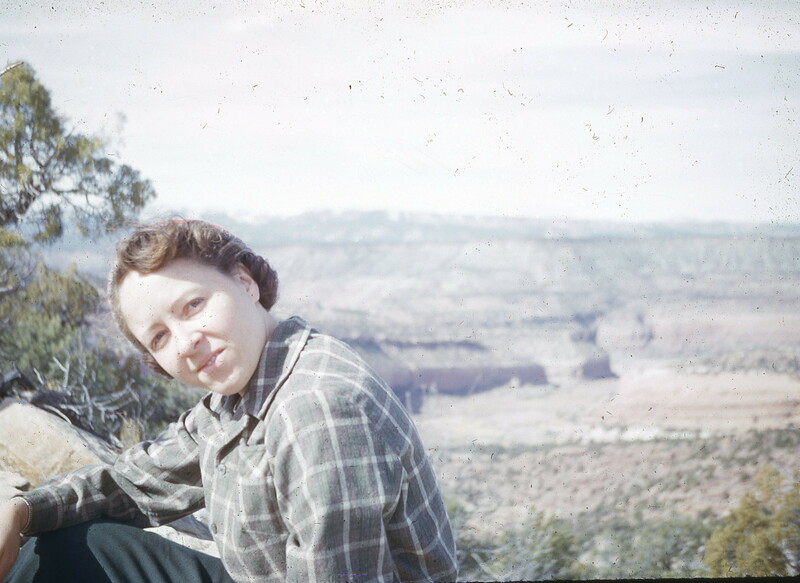 Vee in 1953 overlooking Delores River near her hometown. On the occasion of Dia de los Muertos, I would like to tell you about my beloved Aunt Vee, who passed away in August at the age of 90. She wasn’t born on a horse, but might as well have been. “Best babysitter I ever had,” her mother used to say of Comanche, so patient and careful was he not to dislodge little Vera, who sat in awe atop the impressive gelding. Later, as a toddler, she entertained herself trying to climb up his leg or the fence he was tied to as a means of embarking. Vera became a voracious reader well before starting school. She recalled to me how she walked to school that first day with Richard, her big brother by five years (and my father). He was told to hold her hand – a bit of an embarrassment at his age – and she had to run to keep up with him. It became a habit that stuck with her. “Never walk when you can run,” advised her father. Vera (now Vee, a nickname she got in school stemming from her initials, V.V.) was in complete agreement. She was a good athlete and a sought-after player on all the boys’ ball teams, and so excelled in academics that she skipped a few grades. 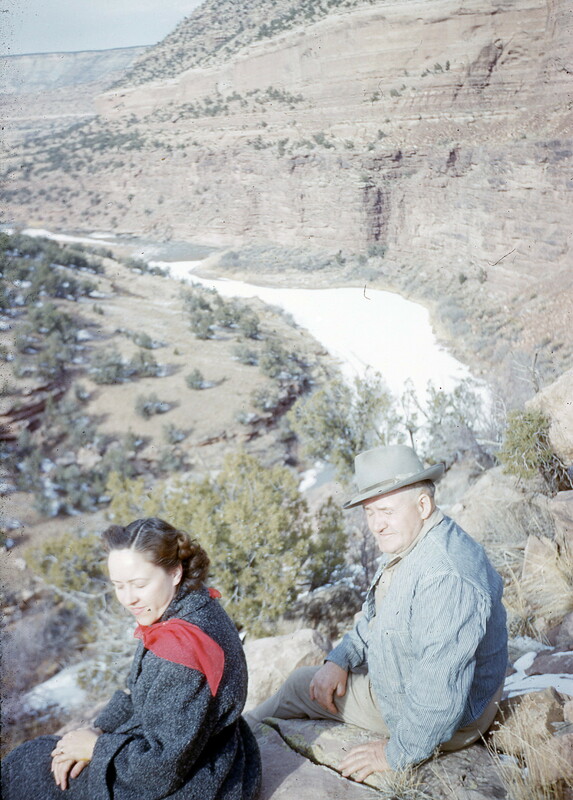 Vee with her father (my grandfather) in Colorado. The one-room school in her home town of Gateway, Colorado, didn’t have a twelfth grade, so Vee went to Grand Junction to finish school, working for a family there in exchange for room and board, as my father had done before her. She was also able to continue piano lessons, and by college was recognized as a very accomplished pianist. After graduating in 1941 at the age of 16, she enrolled at the University of Colorado at Boulder, where her big brother had gone. Growing up, Vee and Richard each had some cattle of their own. Vee had sold hers to help Richard through school, and now he sent her part of his military pay so she could continue her education. It is my great good fortune that Vee’s roommate at Boulder was a graduate student who went on to become my mother! Vee thrived at Boulder, and found a mentor in an English professor who was seen by some as a bit of a curmudgeon. He ate occasionally in the dining hall, and complained to Vee that the young denim-clad women never dressed properly to dine. One Saturday night, Vee got all the girls to wear formal gowns to dinner. The professor laughed and laughed at the surprise, and was ever after more widely appreciated. When Richard came to visit his little sister, often at inconvenient times, her mentor set him to grading papers, taught him some native American dance, and generally kept him from being underfoot. Eventually, Vee figured out that it was her roommate, Mary, who accounted for the frequency and duration of Richard’s visits, and the rest is (my) history. Vee enjoyed and excelled in college, graduating not long after her 20th birthday. Because of her gift for languages, her mentor recommended her to a war-time program where she was taught to read Japanese in its romanish form. She was given a post in Washington, D.C. that she rarely spoke of, because her work there was so confidential. Her job was to translate Japanese teletype messages as they came in to the office of her boss, a nephew of General George S. Patton. One morning she and another young woman arrived early for work and picked up a teletype. It was Japan’s unconditional surrender. They sat on it nervously until their boss arrived. “Don’t say anything until you hear this on the news,” he told them. Vee didn’t say anything for many years. So it was decided. She bought a plane ticket from Seattle, but on the train there she met a librarian who urged her to join her on the ferry instead. The year was 1949. Shortly after arriving, she met the love of her life, Keith Specking, marrying him less than a year later. “I liked his eyes,” she told me. And now I will begin shamelessly plagiarizing the lovely obituary my cousin Joan wrote for her mother, which I note in italics. They owned and operated Rabbit Creek Inn, a six table restaurant 10 miles south of Anchorage. She claimed she was a lousy cook and waitress and liked to tell the story of tripping over Rusty, their big Irish Setter, and spilling an entire platter of fried chicken on the floor of the restaurant. In addition to the restaurant, they homesteaded 160 acres and built the cabin where they lived the first four years of their married life. The first August there, her husband and his partner went on a moose hunt and packed it out on their backs. 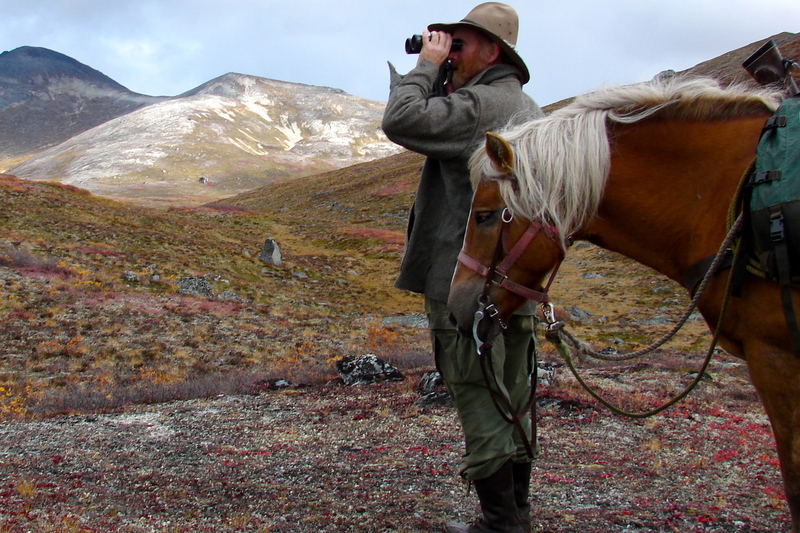 “Why don’t you use a horse to pack it?” she asked, introducing her husband to horses and their value to hunters in Alaska. In 1953 they moved to Hope, Alaska, on the Kenai Peninsula about 90 miles from Anchorage. 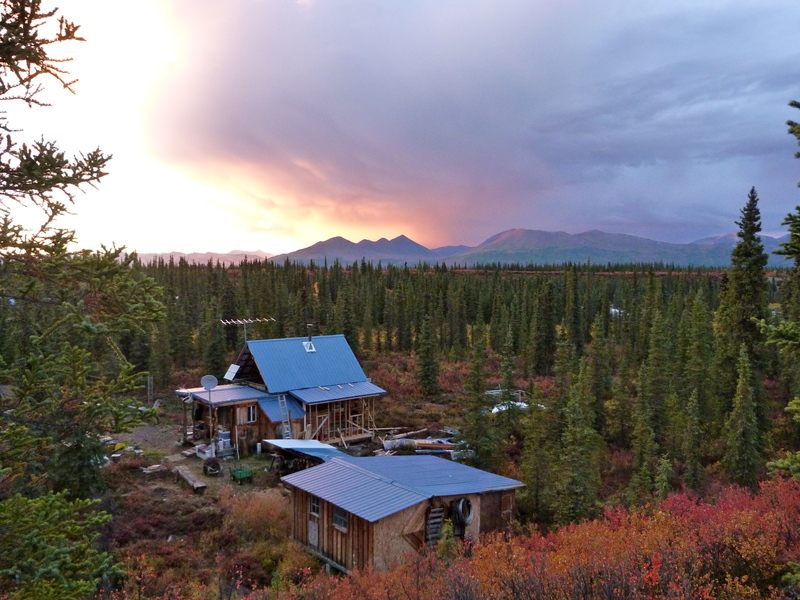 As they raised their family, they started a big game guiding business based out of their main cabin at Brushkana Creek on the Denali Highway in central Alaska. For nearly 40 years in the guide business, she spent hours over a wood cook stove in a cabin or a tent, helped pack horses with supplies needed for a pack trip back into the wilderness, led back horses over wilderness trails, and drove long distances to pick up clients. At the museum in Hope, you might still find a pamphlet talking about the effect of the Good Friday 1964 earthquake, magnitude 9.2, on that little village. A letter from Vee to a neighbor, who was away at the time, reported on the damage not only to the homes but to the land, much of which swamped, and the supply drops being made during that time of physical isolation from the rest of the world. In the late 1960s, her husband ran for the state legislature and spent years as an elected official and then working for the governor. They lived in Juneau during the winter months while he was involved in politics, and summers in the Interior hunting camp. Vee’s many adventures in Alaska are too numerous to share here, but are not forgotten, thanks to her own writings. 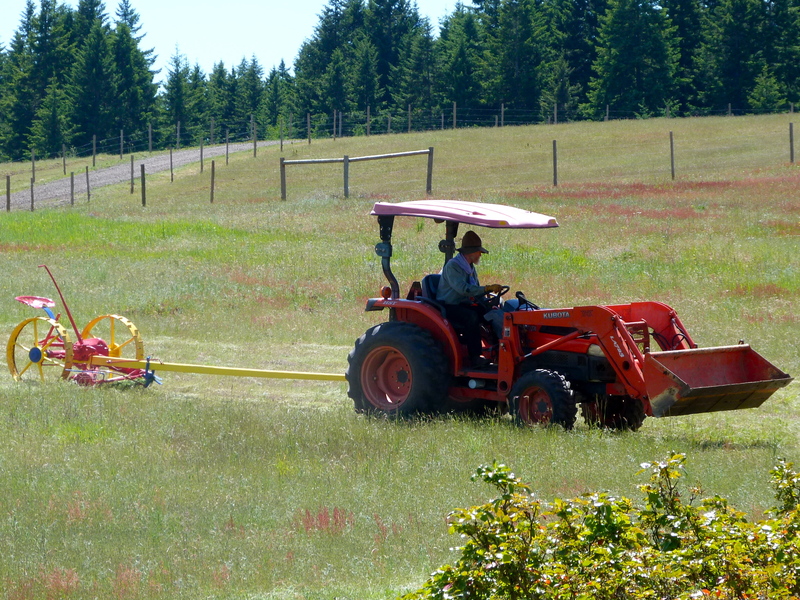 Vera and Keith retired to 160 acres outside of Eagle Point, Oregon, and built their own home. They spent summers trailering their horses up the highway to Alaska, stopping to fish and camp along the way. They had many visitors at their ranch “Chimney Rock” and Vera continued to ride and even show her beloved horse Limelight. Chimney Rock: view from the kitchen window. It was at Chimney Rock I met Vee and Keith about twelve years ago, having seen them only as an infant. My own parents had passed away, and vacation time that would normally have gone for a visit to them gave me an opportunity to finally meet my father’s sister, my mother’s college roommate. My mother had always told me that if I met my Aunt Vee I would know the meaning of true Western hospitality, and she was so right. I only wish I had met her sooner. Upon Keith’s death Vee moved to Helena and spent her final years living at Shelby House, enjoying coffee on the patio and conversation over meals with friends. Calling to talk to her at Shelby House was one of my happiest rituals, and I only wish I could call her now to fact-check my work and tease out the story of yet another one of her many adventures. 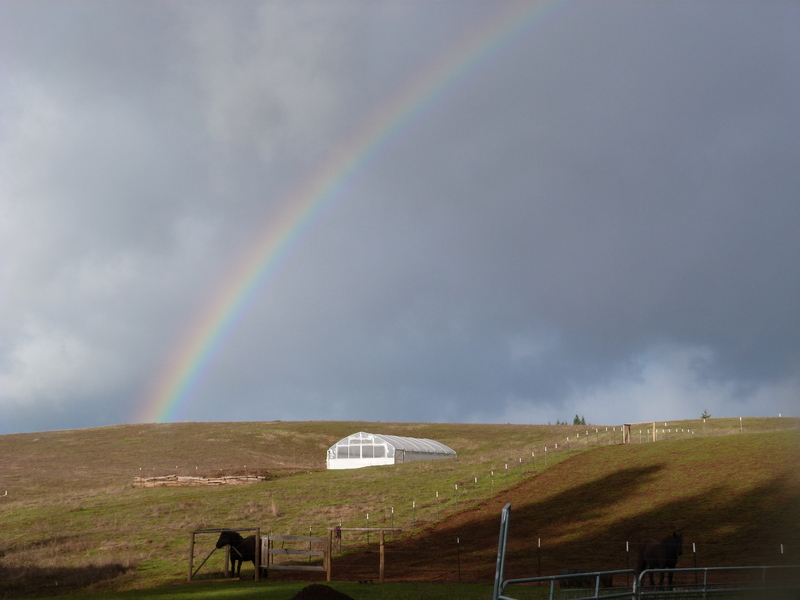 Spring rainbow today over the high tunnel and corral. Every morning, little Miss Sundog puts her feet up on the bed and wakes me with copious kisses, usually right around 5 am. She’s learned to wait patiently (sometimes) while I rouse Ella with pets; morning pets are like caffeine to Ella. This morning, after these loving rituals, we came out to find the downstairs door wide open. (Gary always scolded me for not making sure it was shut tight!) Even so, and without an evening fire, the thermometer upstairs stood at 60 degrees, just a shade warmer than the rainy morning temperature outside. The Great Blue Heron awaits his mate. It’s felt like Spring for much of the winter. But it was the 18th of March when I felt Spring had truly arrived. 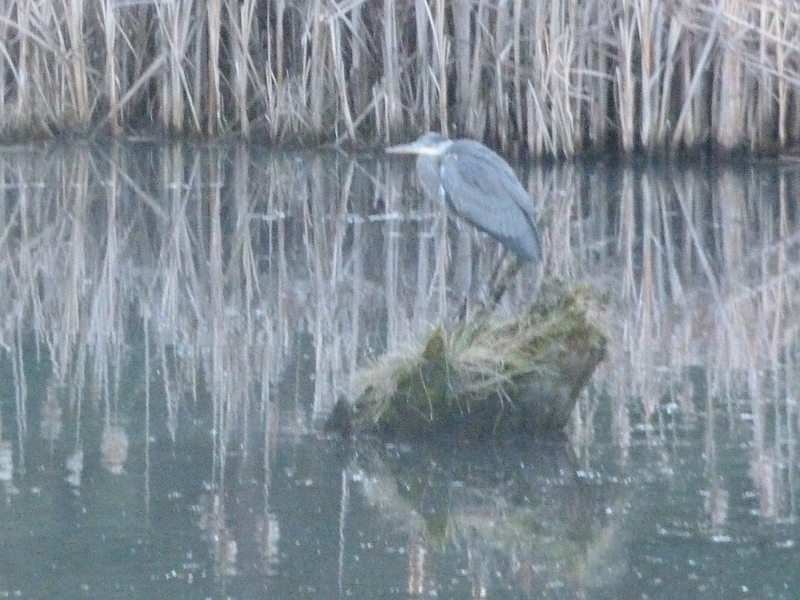 Not one but two Blue Herons appeared around the pond, apparently in a mating dance. The river otters, which I’d thought gone, reappeared. A mated pair each of wood ducks and mallards swam companionably. Sunny and a frog surprised each other on the porch. 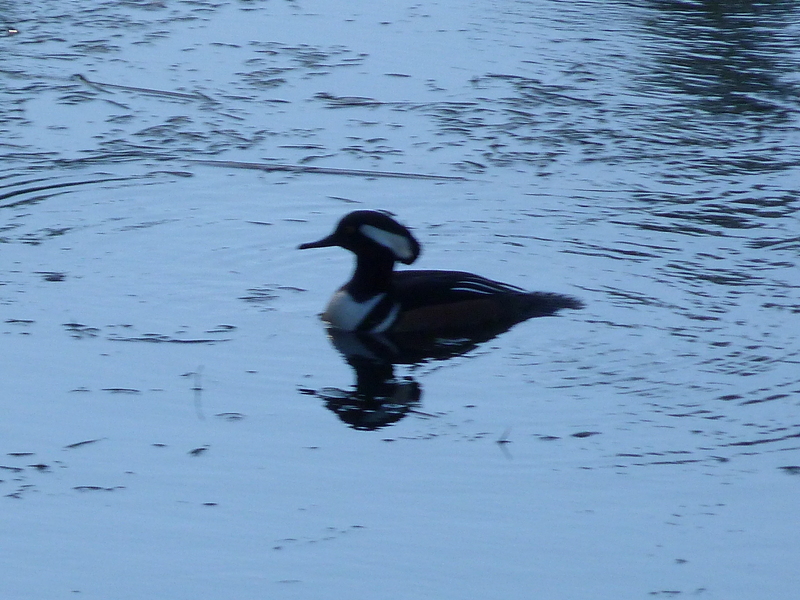 And the Wood Duck too! Though I often feel nothing gets done around here, I know it’s not true. What doesn’t get done is housework and taxes. But the farm is showing signs of life. The garlic we planted in the first days of November is coming up beautifully, along with a fine turf of wheat grass from the not-so-clean straw I bought as supplies dwindled. I officially created Blue Moon Stead, LLC, so I could hire some help. And I found a chef who wants to become a customer! I’m experimenting with growing a custom mix of microgreens for him, and he’ll be looking for green garlic and garlic scapes when they come on. It’s a duck! It’s an otter! 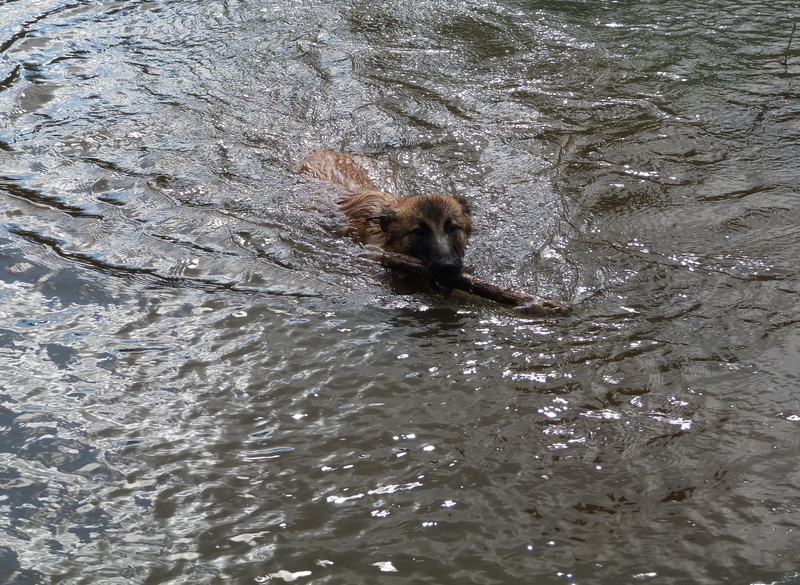 No, It’s the sunny little Sundog, bringing back a stick! 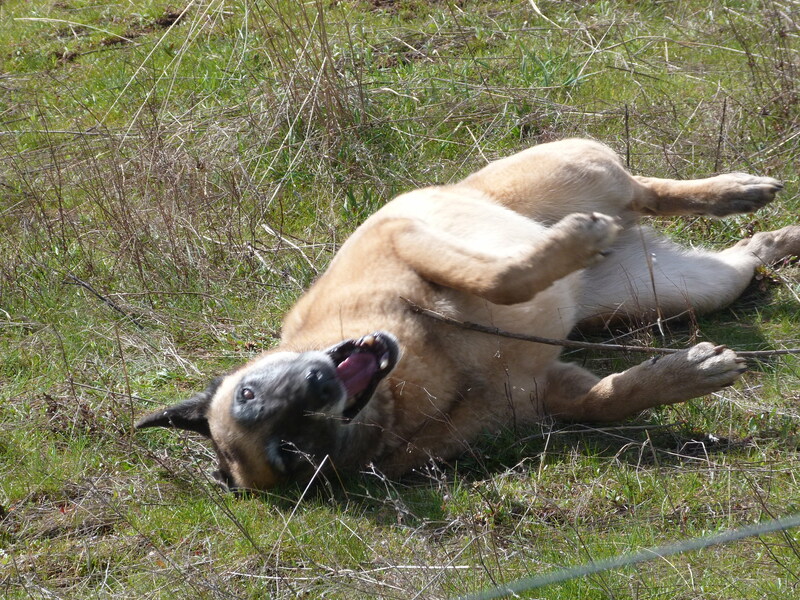 Ella enjoys a good roll in the grass, something Sunny doesn’t quite understand. Sunny prefers to lie in wait for the right moment to start a fight. Andrew, my helper, is here most days as we make up for lost time in preparing for spring. As I take the pups on their walks, I’ve been pulling knapweed and other invasives and pruning elderberry trees; Andrew is burning the piles while fire danger is still low. 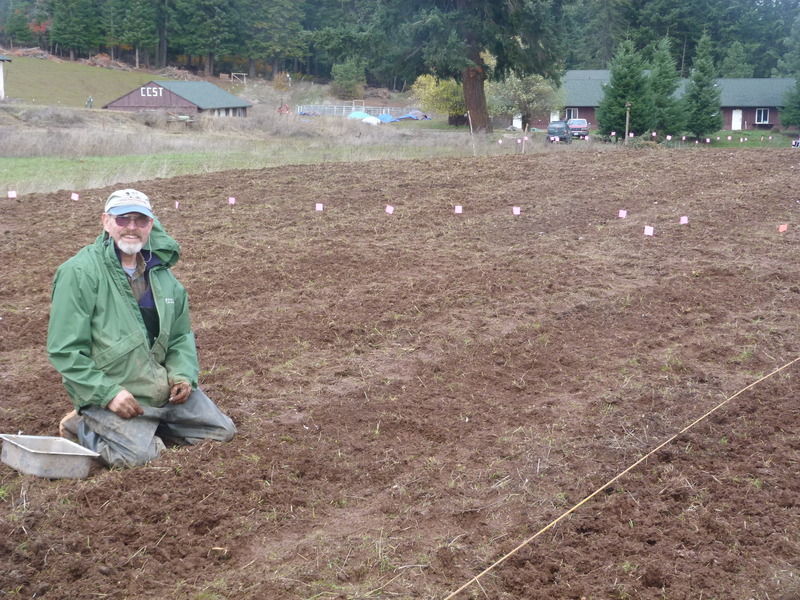 He’s hand-tilled and amended the high tunnel soil, and put low tunnels inside so we can get an early start on planting. Although I’ve never wanted to grow market vegetables, this year I need to generate income along with this new expense, so we’ve decided to trellis tomatoes and cucumbers in the high tunnel and grow lots of basil, all of which are in high demand. I’ve also started veggies for personal use. The microgreens are another project altogether. It’s a question of whether I can get the hang of growing many trays of different vegetables and get them to germinate at the same time. Some need more heat and light than we have now, so we are adapting part of Gary’s workshop, which has heat and electricity, with heat mats and grow lights. I’ll grow beets, carrots, kohlrabi, peas, broccoli and kale, among other things, and just as the first true leaves appear we’ll harvest them. It’s more intensive than ideal, but fairly high value. Because I do have indoor space it may be something I can do year-round. Most importantly, I have a potential buyer! I attended a cooking class at one of the good local restaurants with my friend Norma, and the chef mentioned using microgreens. Norma reminded me of that when she took me to lunch for my birthday, so I emailed him just to find out what he looked for. To my surprise, he said his supplier was retiring after 10 years, so could I grow these for him? We’ll see! Dogfight! A favorite pasttime of both girls. I think…. The chef is also interested in green garlic and garlic scapes. I’m not sure how much green garlic I want to sell, as it is early harvesting the whole clove at a smaller size and weight, so the economics may not make sense. But the garlic scapes, a seasonal delicacy in June, I believe, need to be cut anyway to encourage the growth of the bulb. (Note to Annette and Terry: they have to be harvested long before they get tough like the ones we tried to eat last year!) I don’t know how many scapes there are per pound, but I will have many pounds of scapes to sell. I’m also growing mushrooms! I’m taking an online course through Cornell on growing mushrooms commercially on logs. I’m planning to start at a sub-commercial level of 50 3-foot logs of shiitake mushrooms, and the first harvest will be next year. I’ve started one log of shiitake as well as some oyster and stropharia (wine cap) mushrooms. The oysters and stropharia come on more quickly, so I might do more of those as well. 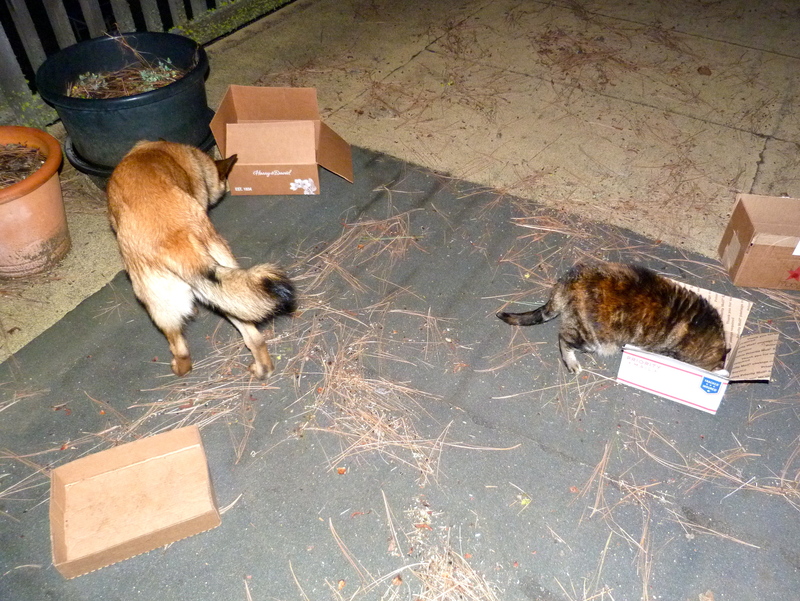 Nosework practice — Mira found the chicken in the box first! Sundog concedes the point and moves on while Mira collects her chicken. I’m not the only one in school. Ella is taking her first class ever, joining Sunny in learning Nosework. They love this class. What’s not to love? I hide cubes of ham or something tasty inside boxes, on top of chairs, under baskets and just in a variety of places at various heights. 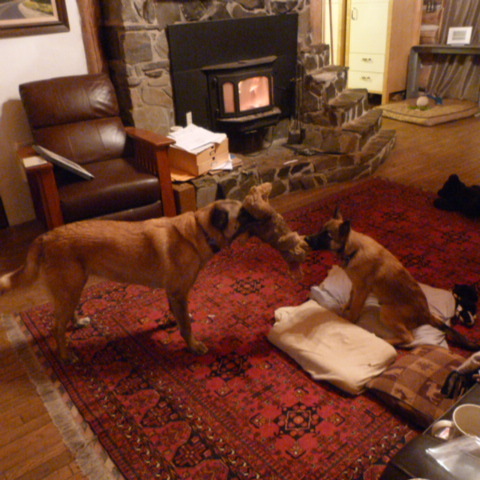 The dogs do what they do best: sniff around to find them. Eventually they will learn to find non-food scents, starting with essential oils of sweet birch, cloves and anise. Most mornings I hide the treats out on the deck, and one at a time the girls diligently (and eagerly!) do their homework. 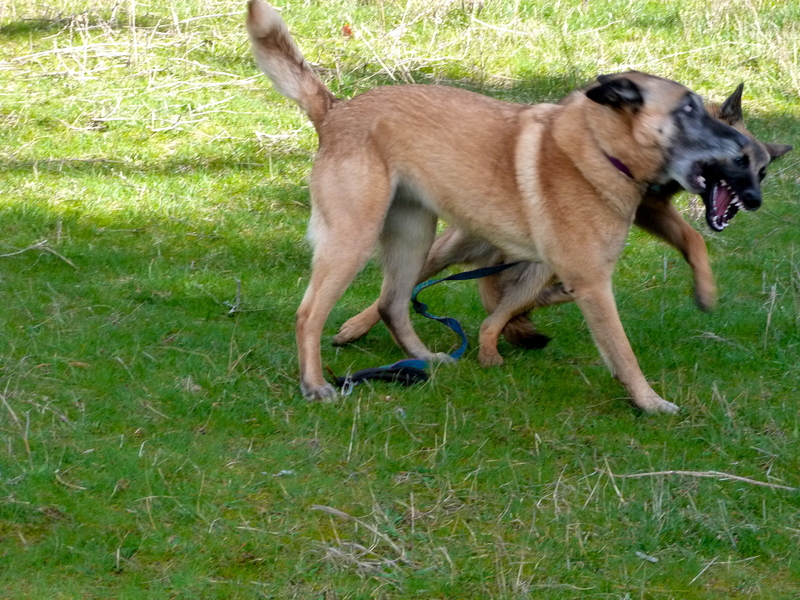 But I have to make sure the cat is inside – Mira is a pro at nosework, and can beat the girls to a treat if I’m not careful! As I wrote this morning, Mira sat on my lap. It had taken her months to get on reasonably comfortable terms with Sunny, who takes a bit too enthusiastic interest in her. Ella, sitting on the couch next to us, turned to see me rubbing under the kitty’s chin and decided if I was petting I might as well be giving her a tummy rub. As she turned belly-up, she “accidentally” kicked Mira in the face. So my lap is now cat-free, the sun is long up, and it’s time for me and the pups to go on our morning walk this warm and rainy spring morning. Wet from a swim, ears wide as she eyes Ella in attack mode. That’s my puppy! But can you believe this is my little puppy? Sundog at 6 1/2 months. A number of years ago I wrote to Gary wishing him a happy Winter Solstice. He wrote back saying it was bittersweet, representing as it does the “death of winter.” I only came to understand his sentiment the winter we were together at Brushkana: the joy of late sunrises, cozy fires, animal tracks in the snow, astounding views under the crust of the river, sunset skiing atop the river past browsing moose. We had time to read, reflect, talk, dance, cook, write, carve, and plan. Shortly after Solstice we started to gain an hour of light every 10 days, an astounding change that left me in a continual struggle to adjust. Spring in Alaska still allowed for beautiful skiing and other “winter” pleasures, but we felt a sort of obligation to those longer days, to use them more intensively. Today another winter begins, and dies. Six months ago today, my family and friends joined me here for a memorial service for Gary. Since then, I managed through some projects to improve the cabin and property that Gary had suggested to me, sold our Norwegian Fjords, Drader and Konall, to loving new homes, brought the outside cat in, and adopted a sunny little Sundog. 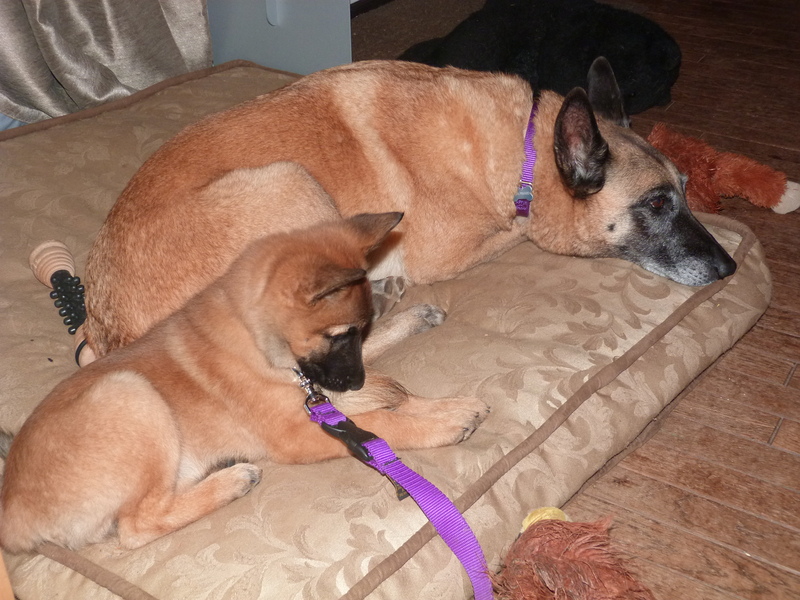 Drader (left) and Konall on their first day here. We are not without joy, the six of us. Ella is a bit jealous of Sunny, but clearly enjoys playing with the little heathen. Sunny is game for anything, and in her rush to keep up with Ella she tumbles like a circus clown, though less and less as she grows. 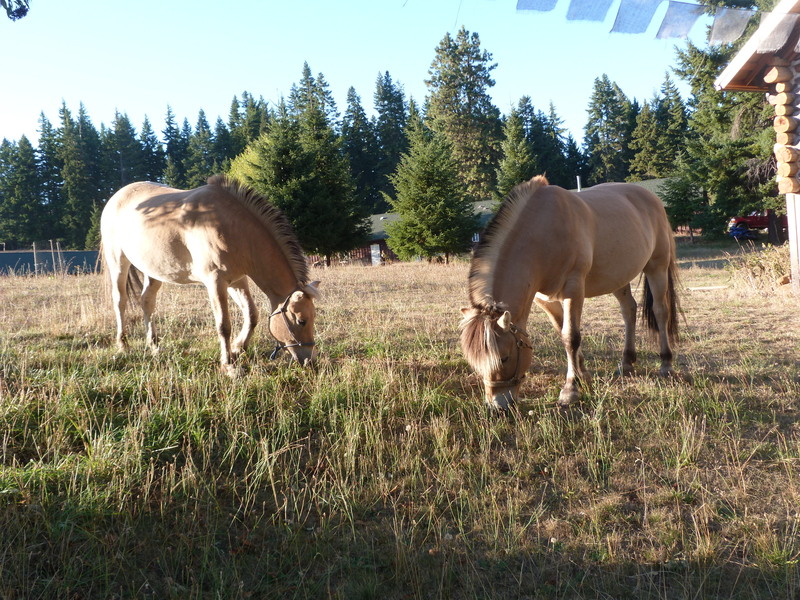 Bess and Duchess have a new winter pasture in view of the cabin; they beg for attention and apples, and I see them running and kicking up their heels when they think we’re not looking. Mira, the cat, has moved up to the loft, but takes pleasure in using a variety of annoyingly urgent vocalizations to train me to climb the stairs to provide room service or a little cuddling. Sunny almost never chases her anymore, but “almost” seems to be the operative word so far as Mira is concerned – she remains cautious. Ella sweetly mixes perfect maturity and her lovely manners with sibling-rivalry neediness. I take pleasure in most every day, in the rhythm of my chores, the challenge of training little Sundog, the satisfaction of seeing projects develop and come to fruition. Ella and Sunny enjoy a peaceful moment. I miss Gary terribly, of course. All the usual things I expected to miss – his hug (and if you ever got one, you know what I mean), his eyes and smile, his crazy wonderful ideas, his wisdom and practical skills, the way he danced, the scratch of his beard on my face, his habit of telling me my meals were “scrumptious,” and how he called me “Stinky” and made it seem the best possible term of endearment. I wish I could get his advice on how to keep Sunny from chasing deer or going ice skating; I wish he could share the joy of hearing a new bird, seeing a new sunrise. 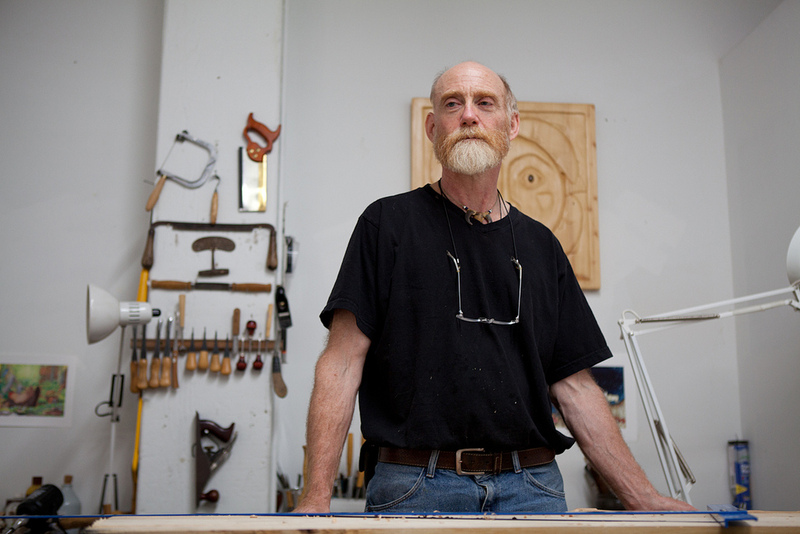 And I wonder what all Gary might have accomplished, in work and art and for our neighbors and community, had he lived another five or twenty-five years. Gary carving the Spring moon at Brushkana. I find that when no one is looking I only have enough housekeeping motivation to keep a clean bathroom and kitchen unless company is coming. I find it hard to cook for myself, but am getting better. I don’t seem to be in danger of wanting to drink too much, but while writing this I just polished off a plate of the first cookies I’ve baked in recent memory. My hair is uncut and unwieldy, and some days I don’t even try past the first brushing. Laundry gets done, but my car is so dirty that I can’t make it into town without mud all over my pants. I need appointments with the dentist, eye doctor, and a dermatologist to look at a mole on my back that Gary’s not here to describe to me. I put off simple things, am months late on a wedding gift (sorry Eric and Nigeen), and will miss getting things out in time for Christmas. I have some good friends and see them regularly, but find it way too easy to shelter in place here with my animal family. I tell myself I want to learn how to do things like maintain the tractor, but I can’t bear to watch youtube on something so boring, and if I can get someone to do the job for me I manage to find something urgent to do rather than watch and learn. Gary directs as niece Kristen moves the orchard box into the garden. Friend Steve thought he’d retired from farming (in Fairbanks! ), but made a return visit to Blue Moon Stead this year to plant garlic. On a more positive note, I have managed to catch up on a lot of backlogged work and projects, with help, of course, and have embarked on some important new ones. Finding little Sundog was a bit of serendipity, and an important one for Ella and me, to help take care of us both as 10-year-old Ella ages, and so Ella could help me raise the little one. With a lot of help from a friend, I planted a crop of garlic – 8500 cloves – a project unforeseen at the time of Gary’s death. I joined his acupuncturist in an effort to grow and nurture growers of Chinese medicinal herbs, and became a Master Gardener, meeting some great people along the way. Ella and Sundog keep me smiling. The death of winter foretells the spring. A new year is soon to begin. I’ve had some time to adjust to my new circumstances, and will have to take the opportunity of seasonal rebirth to help me hone who I am when no one is looking. And to find an answer to the question of what I might accomplish in whatever time is left to me. I have been on the receiving end of so much compassion and empathy, grace and kindness – in short, so much love. One thing is sure: this is a time for me to start to look beyond my own needs and cares to offer generously to others in that same spirit of lovingkindness. With heartfelt gratitude and love to you all, I wish you a happy season and a wonderful New Year. A Sundog, rainbow of the darkest days. These last five months have been full with the work of keeping up and catching up on long-idled chores and projects around Blue Moon Stead, and with the love of friends and family who have been so good to be in touch with me, to be here with me, to cheer me and help me adjust to this new life. There has been both a sense of emptiness and fullness, with waves of grief and gratitude for Gary. Gary and I always knew the key to me managing my deep sense of loss would be healthy busy-ness, and we were certain that Blue Moon Stead would provide. It has. Gary left me with a list of projects and priorities and, of course, others have come on their own. 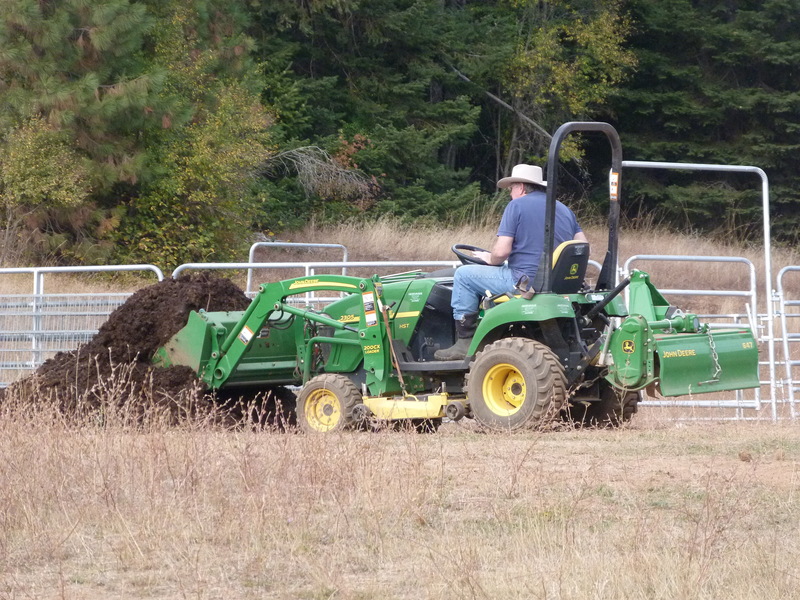 Turning compost becomes time-consuming, unless I can get someone else to do it! In my best Tom Sawyer fashion, I’ve convinced my brother Richard it is fun! I’ve had work done on the cabin to make it more comfortable, especially in winter. I’ve had parts of my forest cleaned up for fire safety and forest health. My brother, Richard, after spending quite a bit of time here in the month or so after Gary died, came back for ten days in September to help with everything from shoveling manure and turning compost to assembling carts, taking nails out of boards, putting up horse fences, and moving all manner of things from the deck and porch into storage. 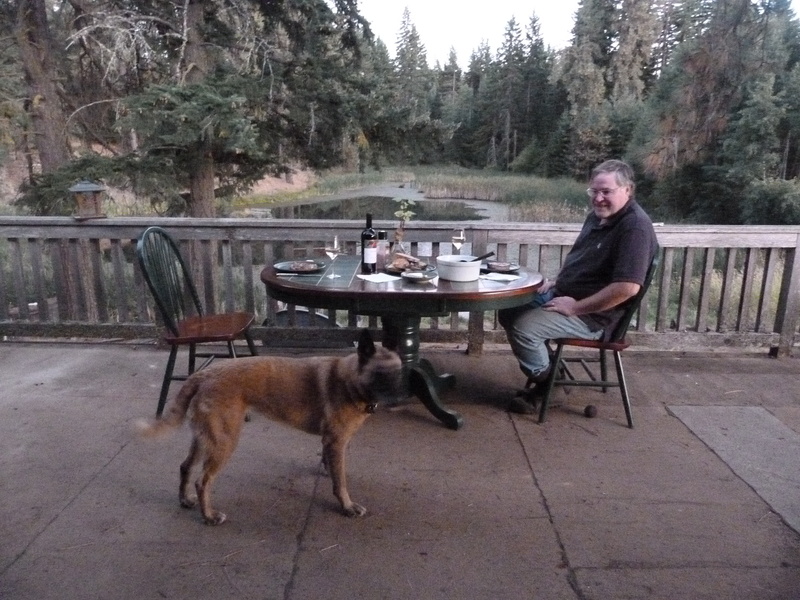 Richard cleaned debris from home improvement projects and other miscellany from the deck, so we could enjoy pond-side dining in the warm September evenings. 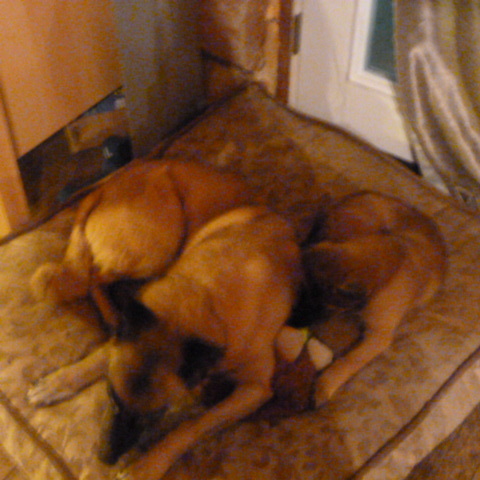 Konall (left) and Drader have moved to loving new homes. I have sold Drader and Konall, our handsome Fjord geldings, and have been getting training on how to work with Bess and Duchess, my two Dales Pony mares who will remain with me. 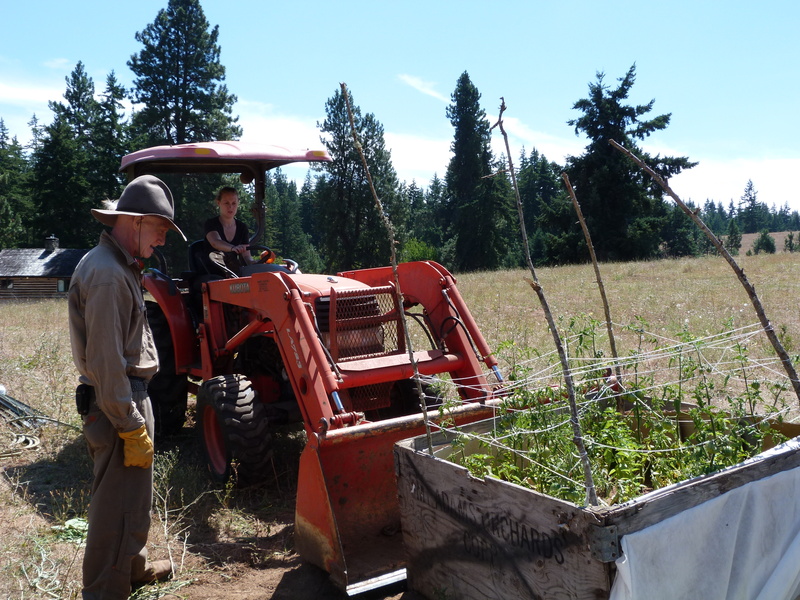 I’ve begun growing Chinese medicinal herbs at an experimental level, and am preparing to start some as true crops, working with Gary’s acupuncturist toward developing a consortium of growers in the Columbia Gorge region. Meanwhile, I needed a crop that will be harvestable next year (most of the Chinese herbs require 3 or more years before harvest), so am planting a whole lot of garlic this fall. Our friend Steve, who visited us last year, offered to help. Steve farmed in Alaska, so knows the meaning of Extreme Gardening! 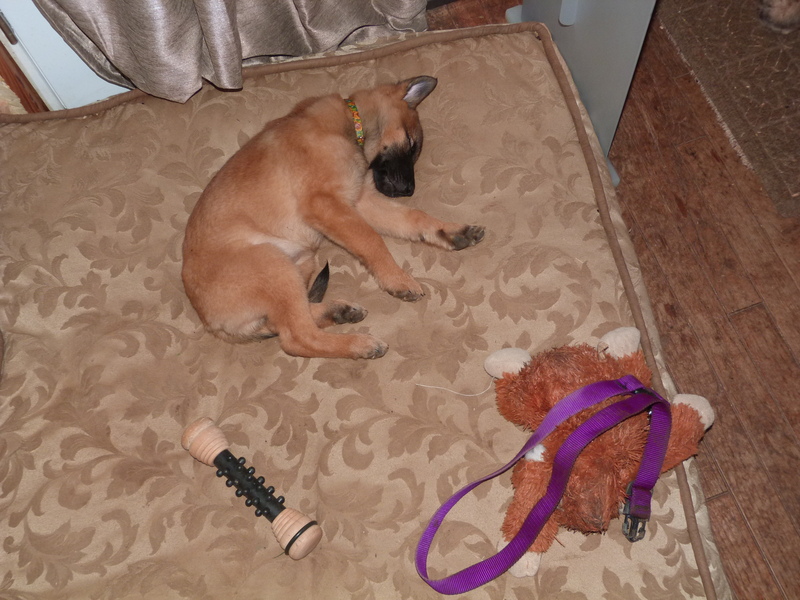 Little did he know that I was looking into getting a little Malinois puppy like Ella, and the timing couldn’t have been more, well, perfectly imperfect. Steve arrived on Thursday, less than 48 hours after we welcomed little Sundog (Sunny) into our family. 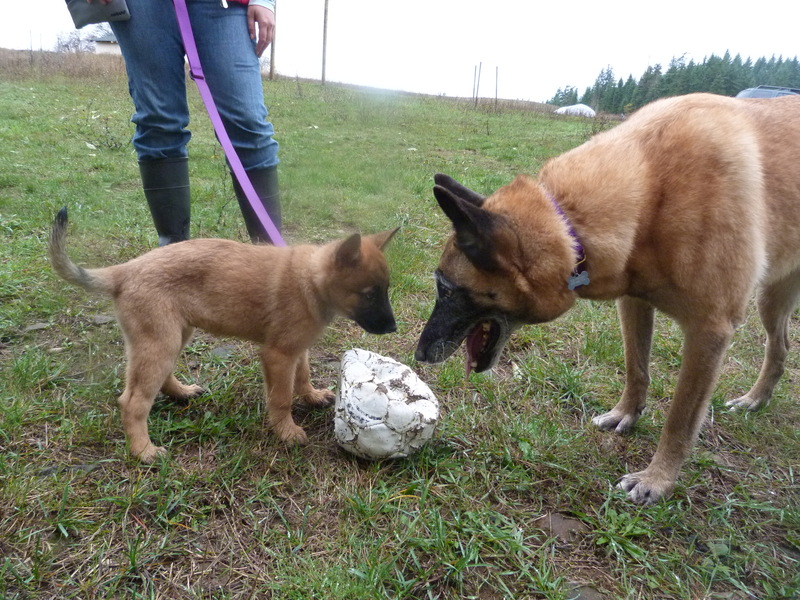 Ella checking out the potential of little Sunny as a playmate. Well, I welcomed her, at least! Ella tolerates her little shadow admirably, but doesn’t hesitate to growl, show fearsome teeth, and bark to discourage Sunny from using her tail as a chew toy, or from using Sunny’s own chew toys as chew toys, for that matter. 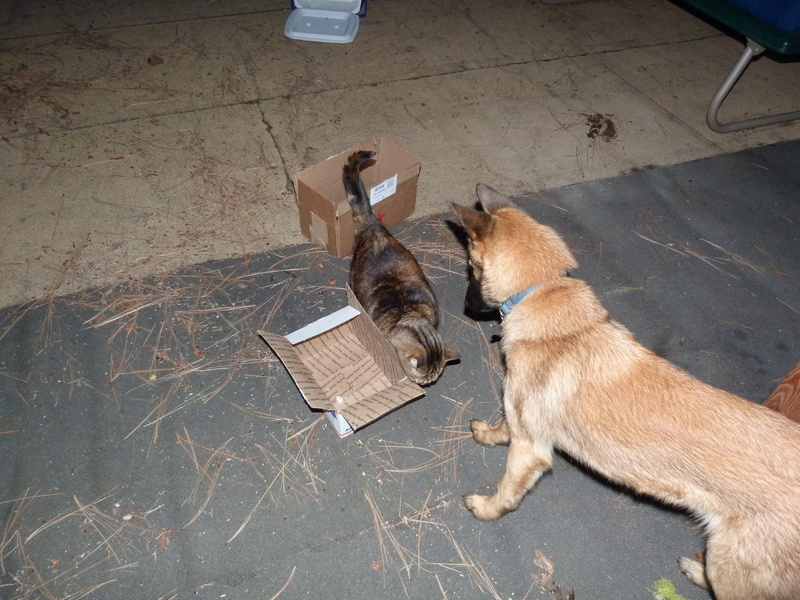 Mira, the cat, has returned to the home with a great deal of caution and trepidation. She is a bit hurt to see someone else occupying her lap – but that’s the only way I can know where Sundog is as I write this! 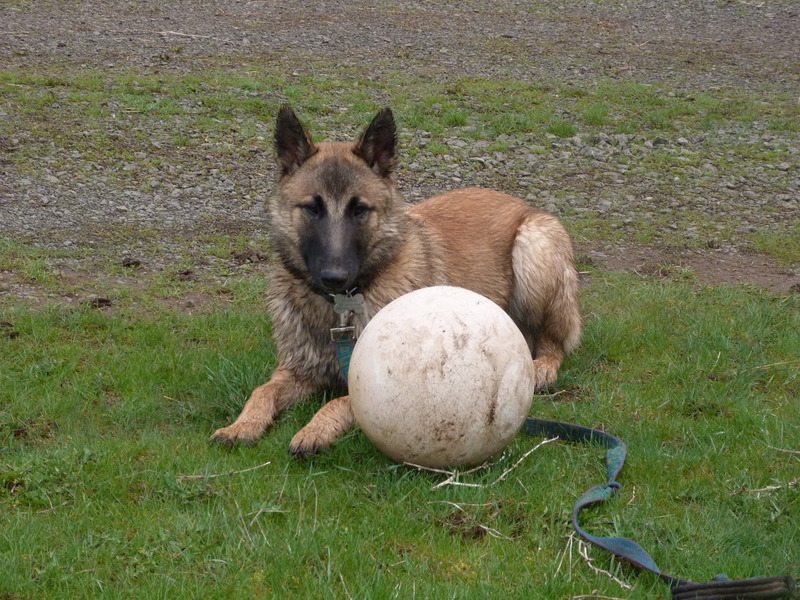 We have a soggy week ahead to plant garlic – I’m hoping the lure of a little puppy will bring some friends in to help. It’s been hard getting back to writing while absorbing the reality of life without Gary, though his love and influence remain with me. 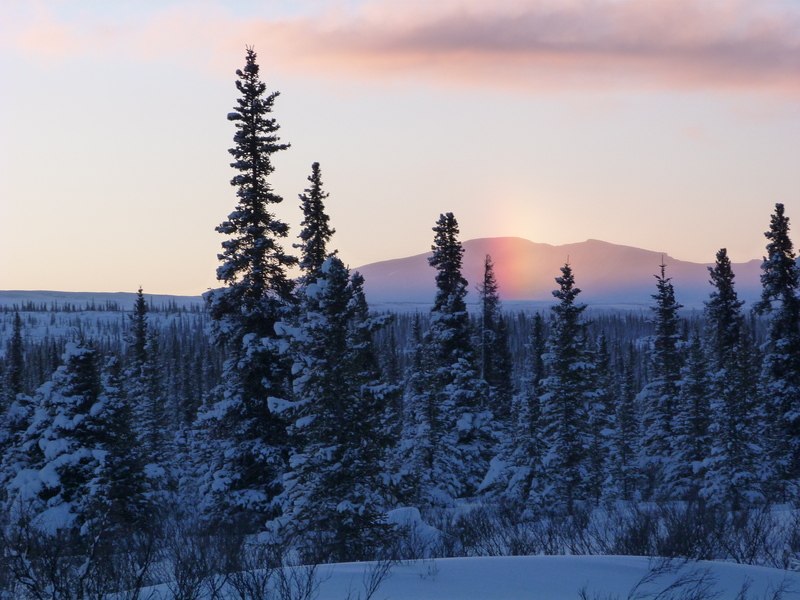 But winter is looming, the Sundog is here, and a different rhythm will pace our days. I hope that means I will be writing again soon! 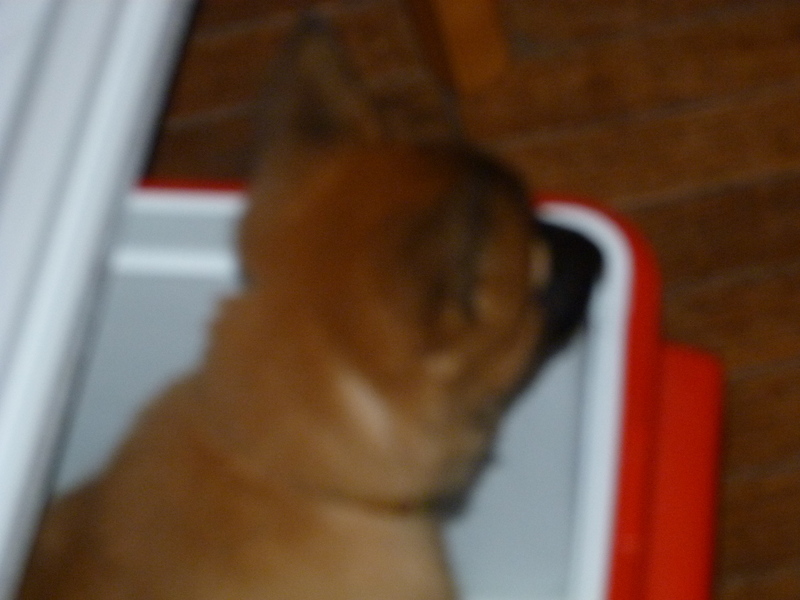 Sundog gets into everything, in this case a small cooler. During our four years together, Gary and I said our share of “I love you’s”, but another feeling often poured from our hearts and out of our mouths. I met Gary not quite ten years ago on my first trip to Alaska, at Brushkana, where I was visiting my Aunt Vee and Uncle Keith. Uncle Keith rang the breakfast bell that first morning and in strode Gary, with his big red beard and trademark feathered hat, carrying the .22 he’d been using to pick off some pesky red squirrels, his dog Bella by his side. He was a real life mountain man. When Gary was 15 years old, he had begun spending summers and more with Vee and Keith and my cousins Joan and Glenn and our dear friend Heidi. My aunt so thoroughly considered him her adoptive son that for many years I assumed he had no other family to speak of, though I could not have been more wrong. I didn’t know my aunt and uncle growing up, except through letters. I’d sought them out in their Oregon winter home about two years before that first trip to Alaska, not long after my own parents had died. What I’m trying to say is this: the odds of me ever meeting Gary were – if you can forgive the pun – extremely remote. We were just really lucky. We corresponded a few times a year after that, and Gary’s letters revealed a reader, a poet, a creative thinker and artist, a spiritual soul deeply connected to the natural world. He lived his life – a life so exotic to me – with a grand sense of humor and high adventure. We became dear friends. In 2009 Gary was diagnosed with sarcoma, a rare form of cancer. Living remotely as he did, with only an unreliable satellite phone for communication, Gary accepted my help finding specialists. I traveled to Portland to join him for doctors’ appointments and see him through surgeries. Gary never forgot it was cancer that brought us together. “We’re lucky,” he reminded me, even as the disease took its awful toll. When Gary first confessed his love for me, I was surprised. When he said he would follow me to San Francisco, I was disbelieving. 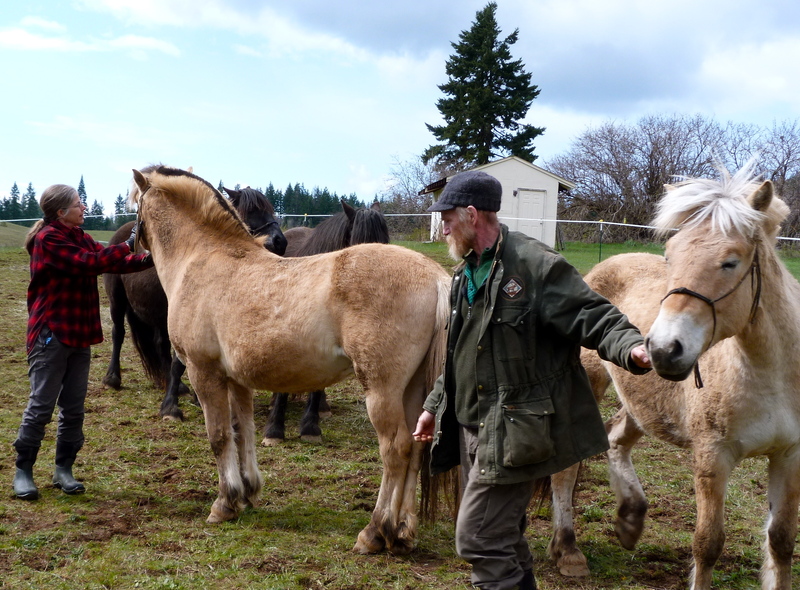 But he and Ella left their homeland and his beloved ponies, and came to join me in a rented flat next to the freeway. Someone asked Gary not too long ago what was the best time of his life. Though I still have trouble taking his answer too literally, he was, he assured me, sincere. “San Francisco” he said without hesitation. Gary at his first SF studio. Photo courtesy of David Gartner, http://www.versusgoliath.com. Every day he and Ella saw me off to work and then walked to his studio, where he was able to carve full time for the first time in his life. When I got home in the evening, Ella would be watching at the window for me; seeing me pull up, she would run to the kitchen where Gary was fixing dinner, and the two would greet me at the door. Gary loved the stimulation of the City: the diversity of people, the parks and beaches, the beautiful organic fruits and vegetables always available, the library and bookstores, the art, music on the streets and in concert venues. He never lost his wonder at all the plants that thrived year-round in the mild climate. He quickly discovered “street finds” and “free stuff” on craigslist, and the amazing salvage and recycling places in Berkeley. Gary found the most unexpected uses of what others threw away. He made a dance stick in the shape of a horse from a single chair leg found on the street, and just this March we saw our dear friend Brent dance with it at a pow-wow. Our next-door neighbor in San Francisco considered it life as usual in the City, I’m sure, when she saw a bearded guy in a do-rag taking a broken child’s chair from her garbage. Her surprise came when Gary returned it to her, repaired and beautifully painted, decorated with a charming chip-carved flower. Gary spoke to the homeless people I’d learned to overlook, even if only to ask them how they were, and to listen to the answer. He showed me my own world through new eyes. We were lucky. 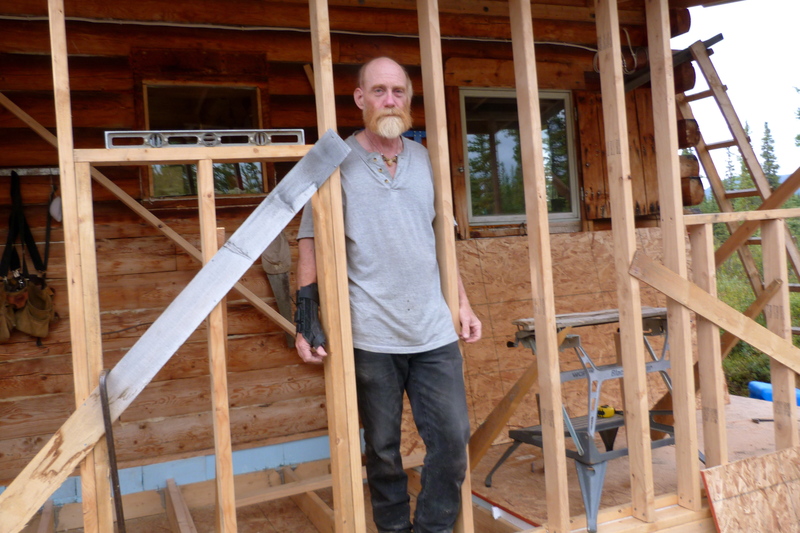 After a year in San Francisco, Gary and Ella returned to Alaska, where he worked to make his Brushkana summer cabin into a cozy year-round home for us. 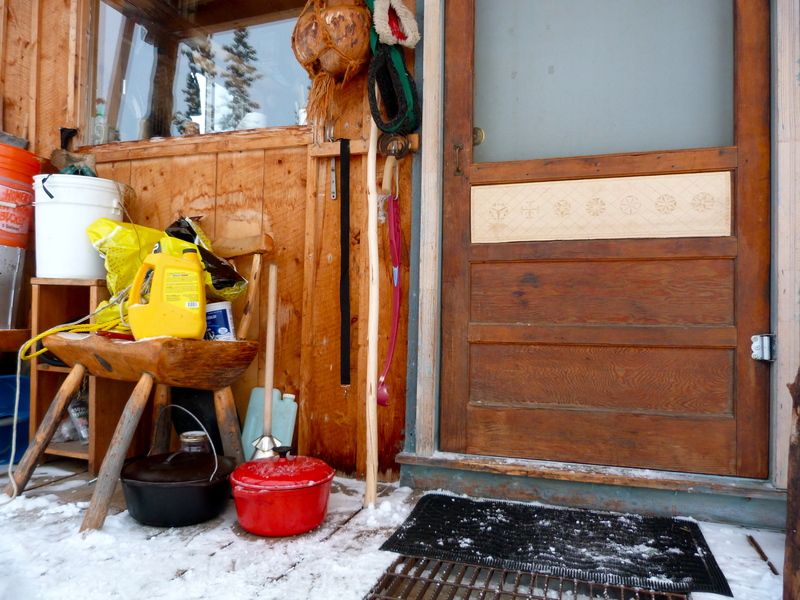 He built an addition with room for our coats and boots, his carving table, and a shower stall for me. We didn’t have running water, so he bought a 3-gallon sprayer normally used for pesticide; it made a wonderful hot shower. If San Francisco was the best time of Gary’s life, Brushkana was the best time of mine. 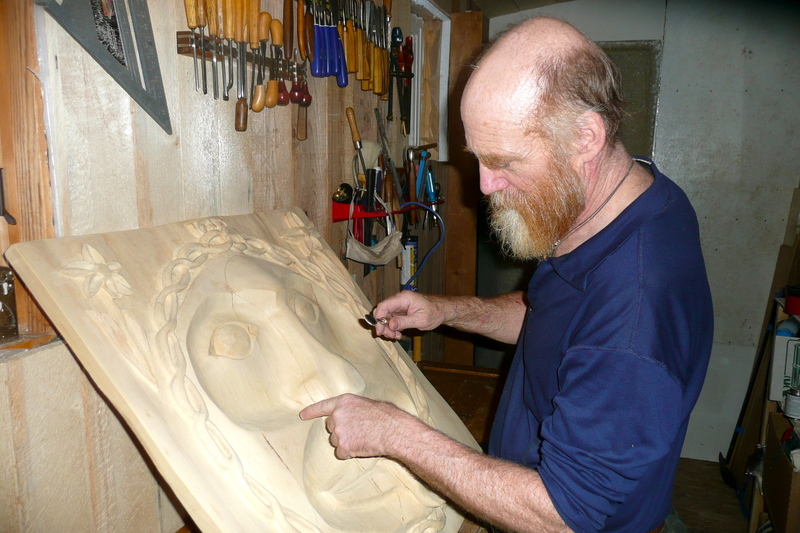 Gary had little time to carve as he made us a home and kept us safe and warm, patiently teaching me what he could. 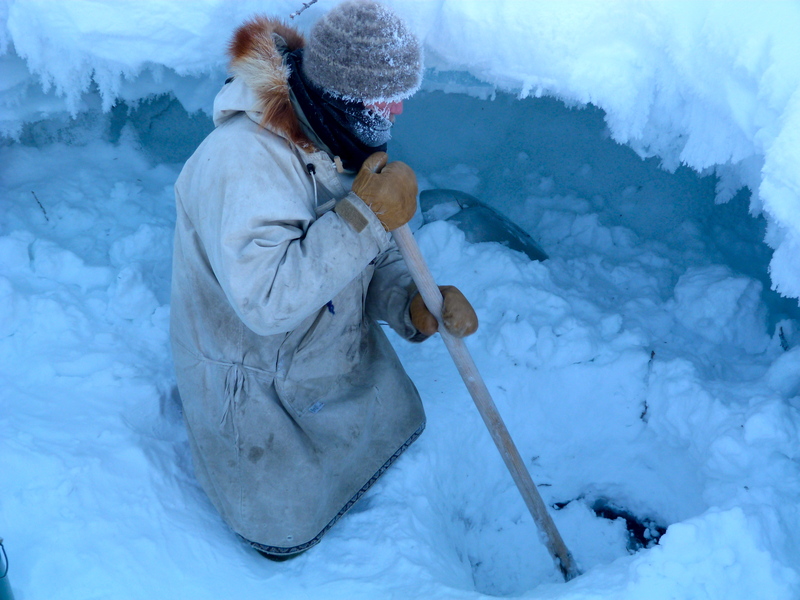 How to make a fire, stack wood, ski, drive a snowmachine, make a snow shelter, insulate the cabin with snow bricks, keep the water hole from freezing over, test the ice, tie knots, pick and clean and can berries, even how to use the outhouse properly without stinking it up. Gary and Ella were at home in their beloved Alaska, and I reveled in our life together in a tiny cabin in a vast and beautiful wilderness. We were lucky. The last two years were filled with doctors and scans, research and treatments, diets and supplements, appointments and disappointments, choosing and abandoning, packing and unpacking, hope and despair, gratitude and anger, laughing, loving, crying, growing and dying. We understood how precious each day was, and we were grateful. Our tribe grew closer and dearer as family and friends gathered around and touched us with their love. I know no one with a stronger will than Gary, or a stronger will to live. We worked so hard to find a way. Gary was willing to do anything, no matter how difficult, to regain his health. At the same time, he was at peace with his Creator and his fate, able to reconcile that struggle and that peace. Gary wrote this: “The saying, ‘it is a good day to die’ means that you have done well in your living and it is a good day, you can go without regrets, leaving loved ones behind, you will, no matter, but leaving them loved is good. We all will leave this and go on. Don’t fear the new or what must happen, accepting but not giving in, there is a balance somewhere between those.” Gary wrote that a year and a half ago. We were lucky. I am lucky, and I am so very grateful. How precious it is to have loved and been loved by such a man. Gary changed me. He changed my world. Gary left me here at this beautiful place with our beloved Ella, making me part of a larger and stronger tribe, including each one of you and his own family, so dear to me now. I love you and need you all. And I pray I will never forget how lucky I am. It’s not Alaska, but it is beautiful and we get a lot more visitors! See a video of the latest escape of the ponies and catch up with us at Blue Moon Stead at www.indeepblog.com. If you are continuing to follow our adventures, please visit www.indeepblog.com. While you’re there, don’t forget to subscribe! 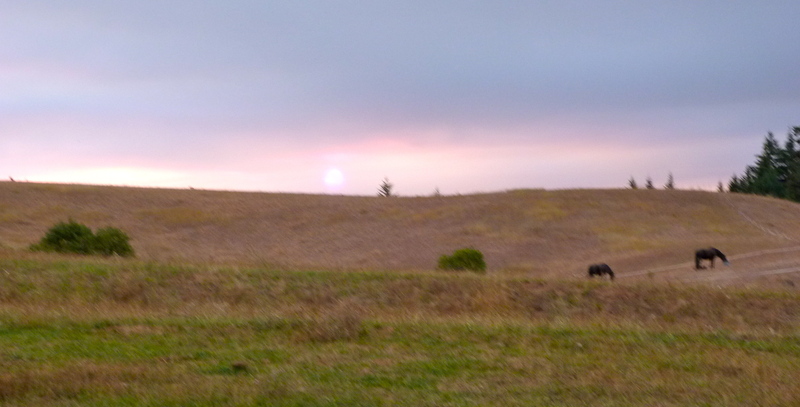 Our two Dales Ponies grazing in the long summer’s evening. Well, long for the lower 48! On Christmas Day, the date of my most recent post, my little blog hit a milestone: 10,000 views. It’s at 11,164 today; oddly, I’m getting almost as many page views per month now as I did when I was actively posting! WordPress, the blogging platform I use, provides me with these and other interesting statistics on my blog. It tells me how visitors arrive at my blog, and what countries they come from. I’m amazed at the thought of people from all corners of the world checking out my blog, and curious to know why they come. The search terms give a hint. 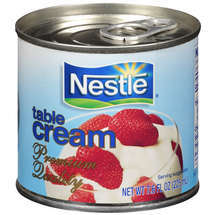 Canned cream: not for the weak of heart. Not surprisingly, the most common search terms are from people specifically looking for me and my blog: indeep alaska, in deep alaska, and variations like account for over 200 searches. Searches related to off-grid or primitive living in Alaska, and things like “people who go deep in the wilderness and live off-grid, self-sufficient, and isolated” are next, totaling about 50, followed closely by searches looking for Alaska terminology. The fourth most popular search is a surprise: “canned cream,” which accounted for 26 searches. Does the DMV in Fairbanks have a long line? Why do people have outhouses in Alaska? Do you turn off freezers in winter in Alaska? Can Alaska wildlife troopers pull people over? Of the photos, the most clicked-on award goes to the photo of my first Saturday night bath at Brushkana, rub-a-dub-dub! 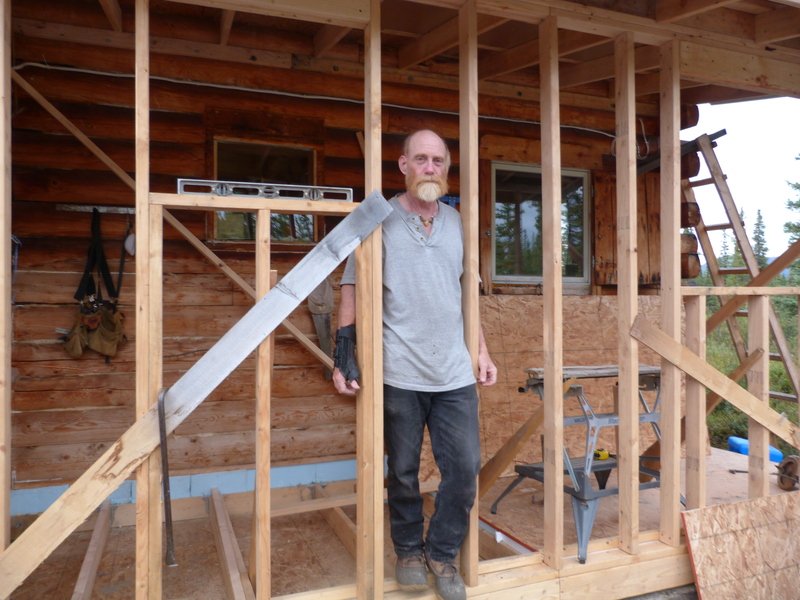 Second is a shot of Gary pausing in his work building the addition onto the cabin. A picture of the snowmachine with a wood-filled sled parked in front of the cabin came in third, followed by several other views of the cabin, inside and out. 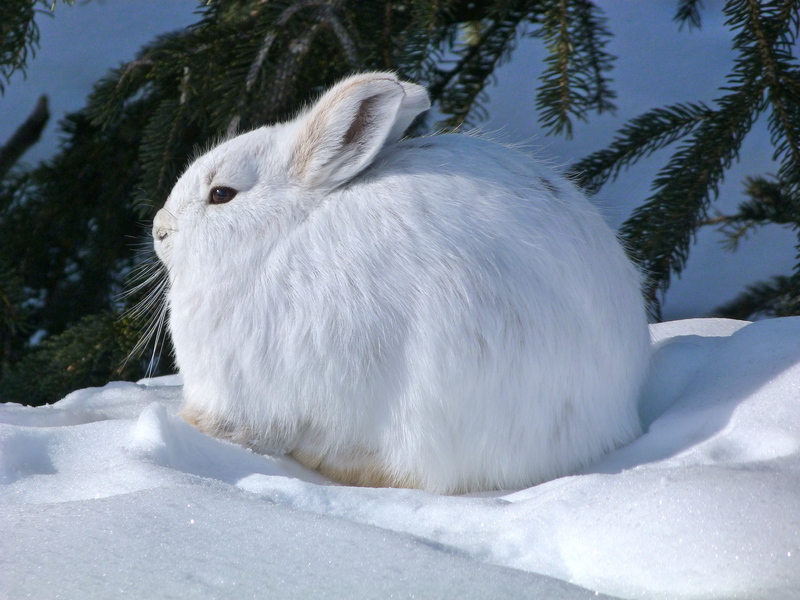 A photo of me just off the snowmachine in -38° below weather and full winter attire was next, and the snowshoe hare got a lot of play as well. Visitors come from all corners of the world. Most come from the US and Canada, naturally, but I was surprised to see that Bulgaria came in third, followed by Germany, India, the Netherlands and Italy. Visitors also came from Bhutan, Lebanon, the United Arab Emirates, Romania, Macedonia, Estonia, Namibia, Georgia (not counting my brother in Atlanta), Mongolia, Iraq, and many more countries. I’m amazed, though Alaska’s draw certainly has no bounds. In Deep (Alaska) has been great fun for me, and accomplished my goal of staying in touch with friends and family and creating a photo journal for myself. I was surprised and thrilled to make new friends through the blog, too. Thank you so much for your friendship and encouragement! Though my Alaska story has come to an end, my adventures continue. 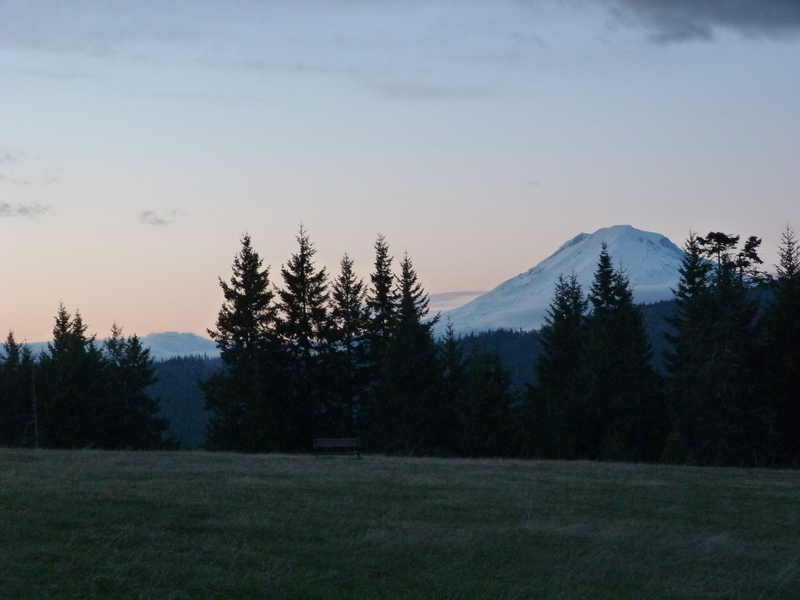 I’ve bought a beautiful, neglected 120-acre farm in southern Washington. Gary and I are in the process of moving and making plans to renew the soil and fix up the cabin, which is, in its own way, far more rustic than our little Alaska home. I invite you to join us, and to stay in touch by checking out my new blog, In Deep, at www.indeepblog.com. Gary and I arrived at Chimney Rock in Eagle Point, Oregon, about ten weeks ago. Our setting is a beautiful oak savannah interspersed with pine, madrone and manzanita on a land of springs, seasonal creeks and ponds. Several horses and a mule or two graze contentedly. These horses aren’t ours: a neighbor has surreptitiously let them in to graze our still-green pastureland, and we pretend not to notice. They ignored us until I began feeding them carrots; now the small herd races the car to the carport when we return home, and even the shyest approach for a treat. Ella stands aside, nervously eyeing the mules, who have it in for her. View of snow-covered hills from the kitchen window. Snow has paid a brief visit. We’re hoping for a few inches so we can use our sled to collect firewood to replenish the supply. Hiking the hills and fields here, I feel as though time has stood still since early October, when we were getting our first snows in Alaska. Our lows are in the 30’s; there the lows are in the -30’s. I close my eyes to picture it: our cozy cabin, sunset pinks on the mountaintops, frost blossoms on the ice, moose browsing the riverbank. The chance to live that life, even if just for a year, was the gift of a lifetime. As we enjoy our quiet celebration here, I realize the gifts we share today are sweet tokens, but nothing compared to the gifts that came to us through the year, through the years. I think first of my Aunt Vee, who has given me so much. If it weren’t for her, I never would have met Gary. Vee moved to Alaska as a young woman, and I didn’t come to know her and my Uncle Keith until about ten years ago. They welcomed me here at Chimney Rock with open arms when I wanted to visit not long after my parents died. 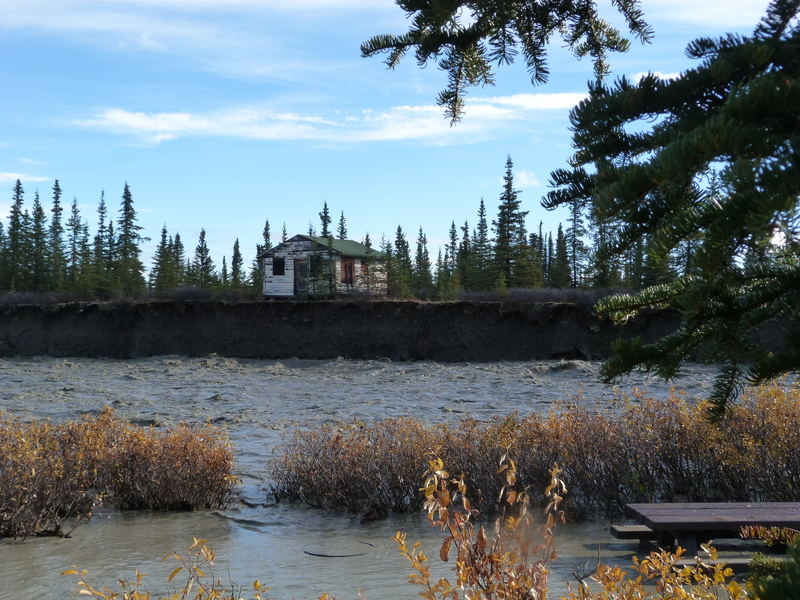 When they invited me to join them at their summer cabin in Alaska, I used my six-week sabbatical from work to make my first trip to Alaska in 2004. When Uncle Keith rang the breakfast bell that first morning, Gary walked into my life. Two bucks sparring in the front “yard”. 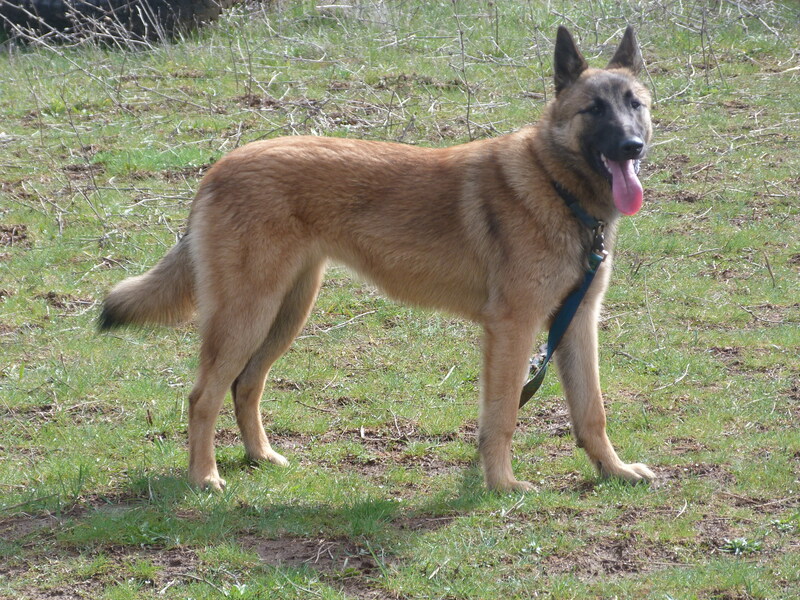 A third took off with the does while they were distracted, circling back around the fighting ring in his chase. Now we’re living at Vee and Keith’s beloved Chimney Rock, in the beautiful home they built to take in the glorious views and the southern sun. 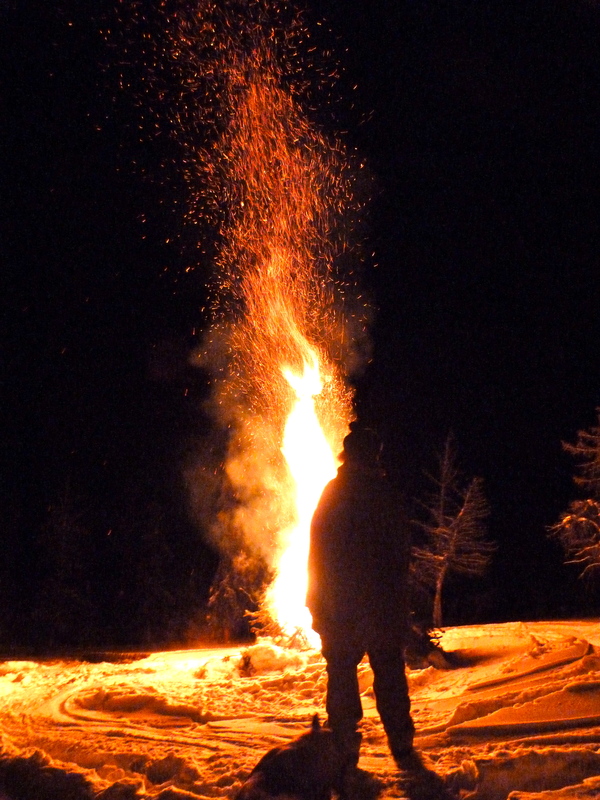 Gary tries to keep a fire going in the wood-burning hot tub, and nights often find us there under the stars. We go on long hikes without ever leaving the property and watch deer, turkeys, the ponies and all manner of birds from our windows. Gary and I spent last Thanksgiving with his sister Karen and her husband Scott and daughter Kristen. Little did I know how important they would become to me. Whenever we needed a home away from home, a shoulder to cry on or a movie to laugh at, I couldn’t have felt more like part of the family. I stayed with them when Gary was in the hospital in May, and that is where he started his recuperation. Their son, Eric, wrote Gary one of the nicest letters I think I’ve ever read; it makes me cry just to think of it. I miss the cinnamon rolls he and Kristen made, but even more I miss watching them clown around the kitchen together making them. Gary’s sister Tina and brother-in-law Craig put us up and put up with us plenty, too; so did their daughters Selena and Dolly. Craig made great meals, helped us sell the stuff we couldn’t bring with us, fixed Gary’s truck, and is a wealth of practical information. Tina took me aurora-hunting, and Selena even cut my hair. They had me folded over laughing with stories and pranks I can’t begin to do justice to here, and I am always grateful for a good laugh! Whenever they came to see us they came bearing huge quantities of wonderful organic produce. Karen did too, but I’m every bit as grateful to her for taking all the pantry items we couldn’t use as we emptied the cabin. She didn’t flinch at taking Rice-a-Roni bearing a suspiciously antique-looking $.36 price tag. Gary’s sister Sonia and her husband, Turi, visited from Memphis; they, too, brought an abundance of organic produce for us. We carefully packed Turi’s sculptures to come with us wherever we call home. On a hike in 75-degree weather with cousin Glenn and his wife Terri. My cousin Glenn and his wife Terri came as often as they could to their summer cabin next door to our place. Terri learned how to cook vegan just for Gary! She’s a wonderful cook, and there were always copious leftovers for us to enjoy when they headed back to Anchorage. Her Springer Spaniel puppy, Mercedes, kept Ella amused and well-exercised. Glenn always made sure my wine glass was full, and left me that final gift of non-alcoholic beer, which I dutifully consumed those last thirsty days of our stay. I commissioned Danae to make this pastel portrait of Ella for Gary’s birthday. Diane and her daughter Danae let us park my car and plug it in at their place all winter. They were always ready with a cup of tea, some warm flatbread if we timed it right, and good conversation. Both are talented artists; Danae made a beautiful pastel of Ella based on photos I took. As we were leaving, Diane gave us two wonderfully helpful books on healing. I wore the hat Brenda made almost every day last winter! Brenda and Harold always warmed us with coffee and often with lunch when we got to town. Brenda made me my favorite winter hat, a beaver-lined periwinkle blue knit cap, and as tiny as she is helped me carry over 20 heavy boxes from my car to the Post Office when we moved. Harold helped me get a tire for my car when I had a flat, just when we were supposed to be moving, and put the thing on for me! And I’ll never forget the beautiful, ripe tomatoes from New Jersey Brenda gave me that late September day. Jayne visiting with a few of her dogs. Jayne, Ella’s vet, and her husband Bob gave me a thrill of a lifetime when they took me out with a dog team last fall. They were practically our only winter visitors, coming with their dogs and snowmachine to our little part of the world, bearing gifts of Jayne’s homemade bread and Bob’s smoked salmon. It was Jayne who encouraged me to make bread atop the woodstove, something I came to love doing when it was really cold outside. Gary’s brother Ken and my cousin Joan’s husband Ed have kept our freezer full with salmon and halibut. We nursed the salmon all the way down from Alaska, and did the same with an ice chest full of halibut Ed gave us when we visited him, Joan and Aunt Vee in Montana. We’re grateful several days a week! Richard (left), Joan, Aunt Vee and Ed during our stop in Montana on the way to Alaska last year. I will always be indebted to my own brother, Richard, for driving me up to Alaska when I was moving from San Francisco. I owe his bride, Gloria, big time, for lending him. What a great road trip – it was a chance of a lifetime. My friends Annette and Terry have done too much to describe: let me stay with them for longer than was polite on my part, helped me, listened, advised, took me on hikes and generally distracted and cared for me when I needed it most. They still do. My dear friend Jackie has offered much wisdom and support. Roger Lee and Marcia, longtime friends of Gary, babysat Ella when we were traveling to meet with specialists. Mark bought the truck part Gary needed when we were getting ready to move; rather than letting Gary pay for it Mark suggested he pay it forward, buying coffee and lending an ear to those we meet in clinics and hospitals. Alida’s cousin Ann visited Gary, a perfect stranger, in the hospital. Linda, a childhood friend of mine, and her family opened their home to me and Richard as we drove up, and they’ve offered to do the same when Gary and I travel to Seattle to see his doctors. And I shouldn’t forget Steve and Paul of Tew’s Tire Service in Wasilla, who stopped and took care of my flat tire on the lonely Denali highway that evening just a few days before our big move; they wouldn’t take anything from me but thanks. Jim, the wildlife trooper, came regularly to check on us when we were isolated by the winter season. Jim and Bona, the campground hosts, were always happy to pick up groceries or mail for us when they went to town, and were good summertime friends. Marcia at the BLM brought back the pump handle to the well when we were so very short of good water after the flooding when we were preparing to move. So many of you wrote us words of encouragement, inspiring tales of victory over cancer, prayed for us, sent resources for physical and spiritual health, made us laugh, or just made a special effort to stay in touch. I could never have written my blog without the encouragement of my readers, and it wouldn’t be what it is without Erin, who set up the visual graphics and template for me. We can watch the birds and animals from our bedroom at Chimney Rock. Here at Chimney Rock, our neighbor Harmon has paid us a hundred kindnesses. The folks whose horses we think we have brought a huge forklift and eased Gary’s horse trailer back onto the driveway the day we arrived here, keeping it from tipping into the abyss. These kindnesses and more are our Christmas gifts, and they remind us that what we do throughout the year is more important than any gift we can buy. This might explain why you haven’t received a package from us! Truly, we can’t thank you enough. May 2013 find you continuing to give and receive with joy and grace. Floodwaters rage up to the level of the bridge. I expected to leave in a flood of emotion — a flood of tears, even — not in an actual flood. As the days in our little cabin waned, in number and length, a heavy cover of clouds darkened our daylight and obscured our mountains. Rain melted the termination dust and flooded land already saturated. Three windstorms hit in rapid succession. And the river flooded its banks. After a rainy summer, a few teasing autumnal beauties yielded to more rain: heavy rain, light rain, and precipitation neither cold as sleet nor hard as hail — white, but lacking snow’s delicacy. We took sawdust from where Gary had been milling lumber and spread it on the muddy drive to keep us from slipping, but by Thursday, September 20th, we had more pond than walkway. And still it rained. I lay awake much of that night, listening to the barrage on our metal roof. Another sound caught my attention: a thump and vibration not unlike the first jolt of a small earthquake, or distant cannon fire. I held my breath to listen. Every time I started to relax, I would hear it again. It was the sound of boulders tumbling downstream; the water’s fury kept them noisily on the move for more than a day. 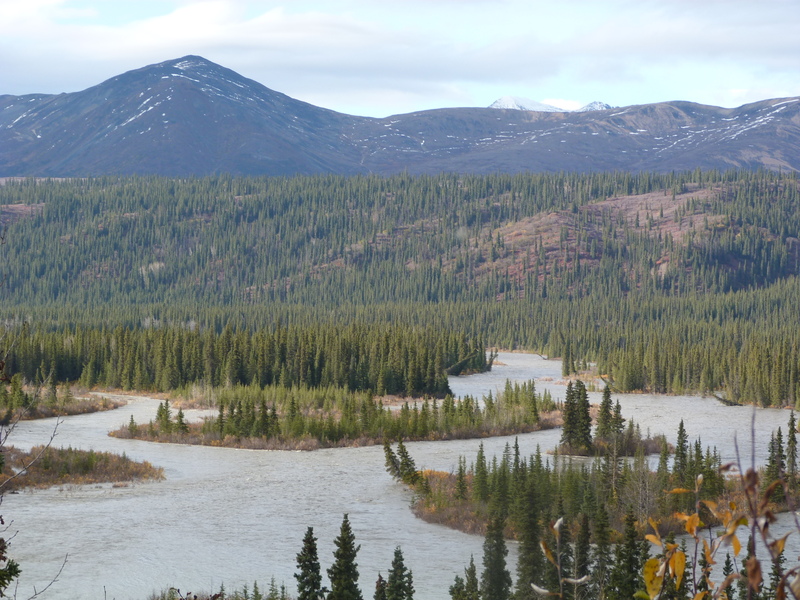 The Nenana River looked like an island-filled lake near the road closure. Ella’s bark woke us early on Friday. My cousin Glenn, on a last visit to his cabin at the end of the season, had come to say goodbye. He had been up since 4:00, watching the river. We went online to check the roads before he left; sure enough, his route was blocked where the waters had destroyed a culvert. View from the campground of the old cabin and its new riverbank. We took a walk to see the river in this rare mood. It had flooded its banks where it could and tore the banks down where it couldn’t, topping out at bridge level. 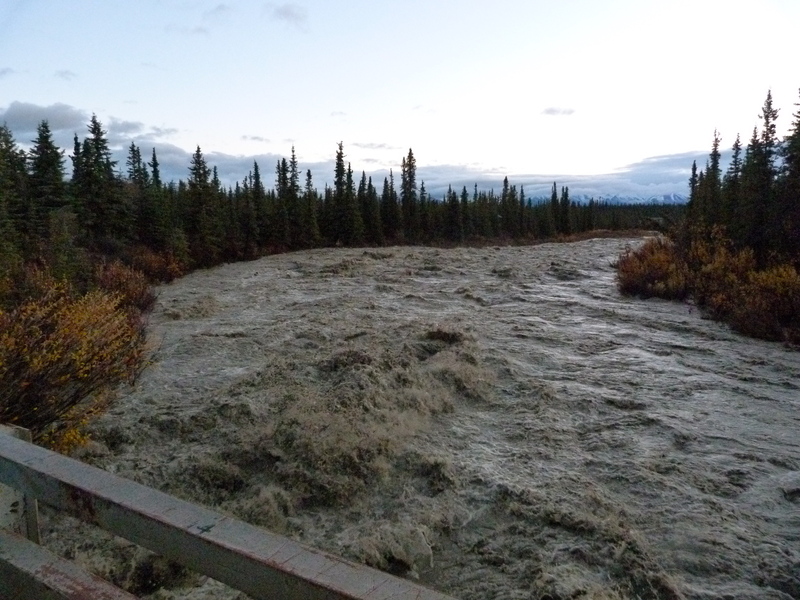 Even after it dropped and slowed, the river continued to erode banks and take down trees. We walked through the campground. The crest had occurred in the night, and we could see from its traces how much more had been flooded a few hours earlier. The old cabin up the path from us lost its front yard and bank. It sits on cliff’s edge; the big old spruce that had so faithfully harbored squirrels for Ella to chase had disappeared downstream. Ella’s favorite path, the one she took me on as many days as I would go, was gone with it. We were originally planning to leave on the 25th, but Gary lost a couple of days dealing with truck problems. Our friend Mark — Gary had helped him out last winter — was glad to return the favor by picking up a needed part and dropping it with Jayne in town where I could pick it up. (https://indeep-alaska.com/2012/01/12/tonight-will-be-a-stormy-night/) So we moved our date to the 27th. But then the road closed, blocking our way to town and the vital truck part. 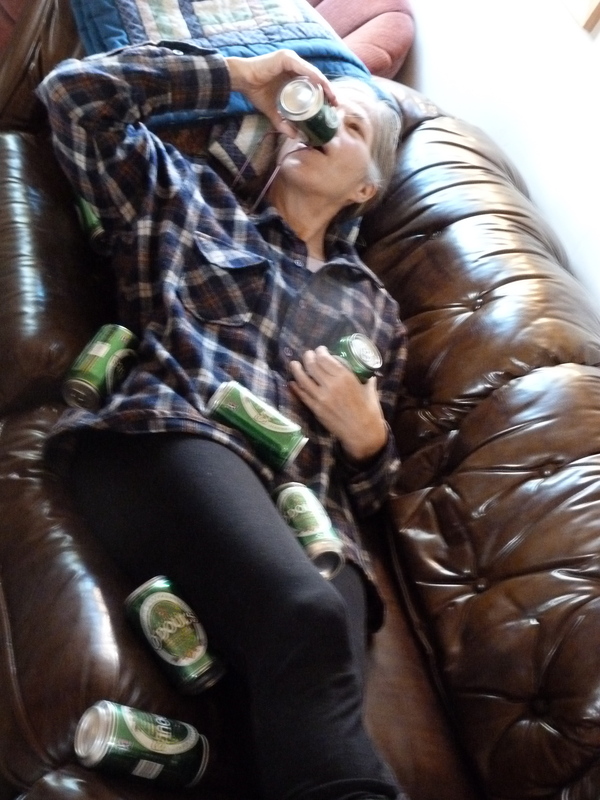 I posed for this when we found the beer in Glenn’s cabin; in my excitement I failed to notice it was non-alcoholic! A water shortage is the irony of floods. The water looked like liquid mud, and had a crisp, spring-like smell. I could filter or boil it, but it would be mud all the same. The Bureau of Land Management had taken the handle off the campground’s well pump two days earlier; my buckets were full, but I needed to refill them nearly every day. So we stopped showering, did dishes only when we ran out of clean ones, put rainwater in Ella’s bowl, and I started drinking the non-alcoholic beer I found in Glenn’s cabin instead of water. Hardly desperate measures, clearly, from the perspective of Sandy’s aftermath, and made easier perhaps by our quiet isolation. We made it through a week with about 40 gallons of water, at which point Marcia from the BLM came by to check on the campground. She saw our dilemma and quickly offered to put the well’s pump handle back on overnight. I filled every bucket and stock pot I could get my hands on, giving us enough to last until we left. “Hey!” I shouted, running after the truck, not quite believing my luck. It stopped. Hearing my story the driver, Steve, backed up the truck to my car. From the passenger seat Paul emerged. I had just met Paul at the café, where he had helped me carry my food out to the car. This was because I had ordered one too many milkshakes to carry out by myself. Steve and Paul quickly found the gash in my tire and put on my spare. “How much do I owe you?” I asked. I’m going to miss Alaska. Ella and I got home after dark that night, and embarked on a two-day trip to Fairbanks the next day so I could get a proper set of tires for a 3,300-mile trip. It was another delay, but it gave me the chance to see Gary’s sister Tina and her husband Craig one more time. Ella smiling at the season’s first snow. I drove back with Ella on Sunday the 30th under a bright moon and an aurora. Perhaps the most amazing aurora I ever saw came the following night, an ephemeral dance of scarves of pink and green just above our cabin. That next morning, October 2nd, we woke to the silence of snow. By afternoon we had an inch or more. Ella danced and pranced, rolled and ran and grazed on the soft, cold bunting of white that heralded her favorite season. I laughed through tears to see her joy. 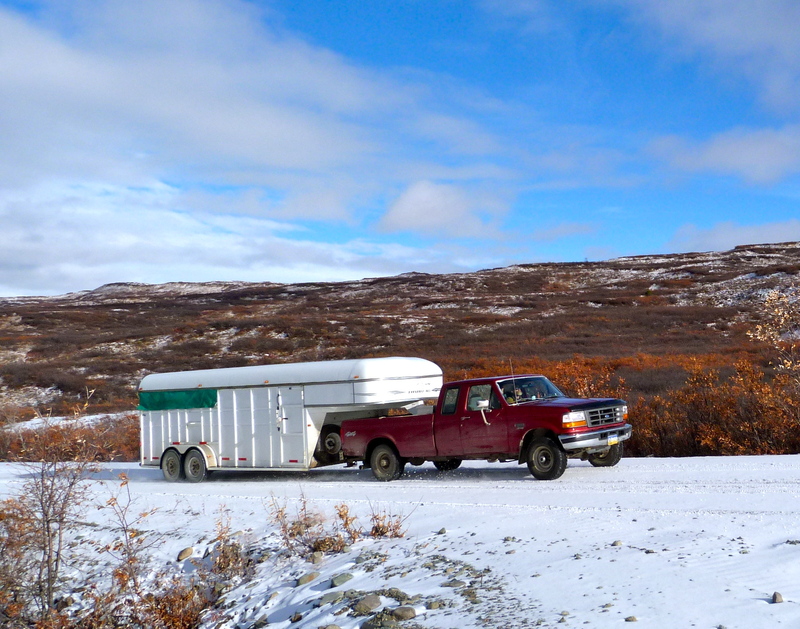 Gary pulls his overloaded four-horse trailer, Day 1. By Day 12, he had three flats and a near-disaster on the driveway once we reached Chimney Rock. 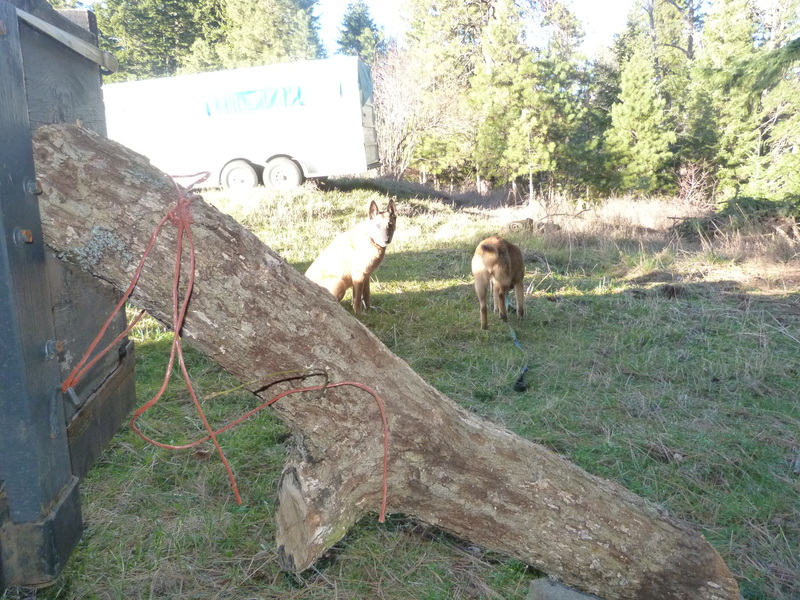 On October 3rd we drove out the gate, Gary leading the way with his now-functional truck and a four-horse trailer overloaded with everything from a lumber mill to bicycles. I followed with a light load: Ella and our camping gear. After the tense and hectic days of packing and loading, choosing and abandoning, the drive was a peaceful change that day. Prints of caribou and moose in large numbers and a solitary bear with enormous paws caught our eyes as we drove through the new snow. Bald eagles and their young flew over and around us, tormented by ravens. 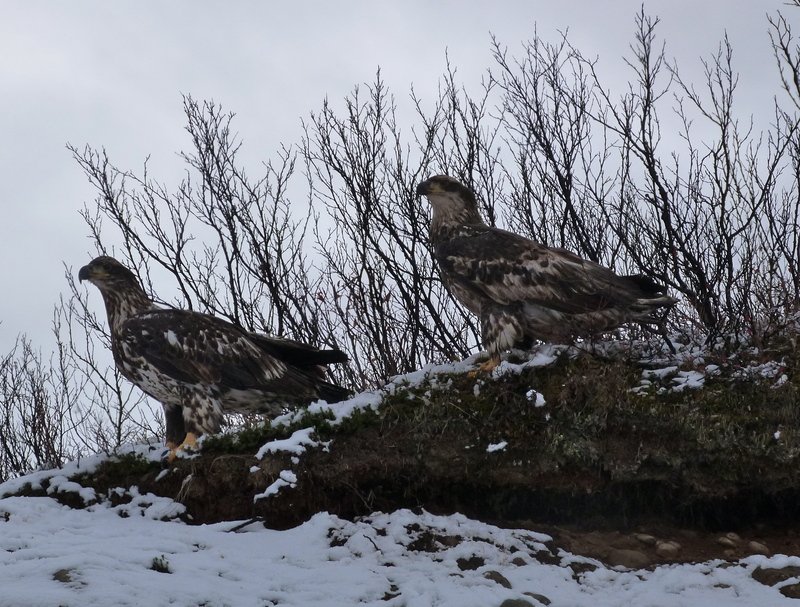 Juvenile bald eagles take a break at the side of the road. The drive took twelve days. We slept in the back of my Forester, Ella’s bed up front. We stayed in campgrounds or RV parks where we could, turn-outs where there was nothing better, and motels as we got into more populated areas where turnouts offered even less privacy than up north. As we drove into warmer weather and an earlier season, our radios began to pick up signals and news of a wider, busier, more anxious world. 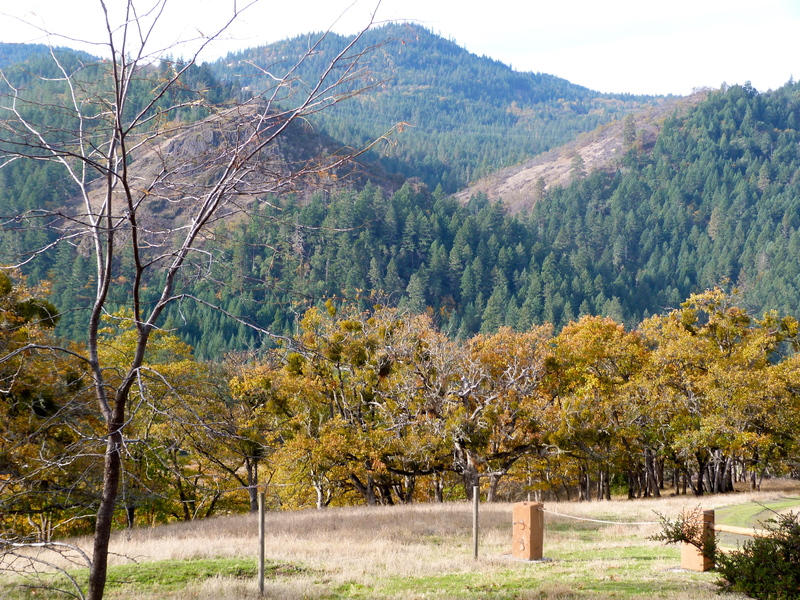 Chimney Rock, our new home, is a quiet retreat, an oak savannah interlaced with pines and huge meadows amidst beautiful hills and striking basalt rock formations. One of these, Chimney Rock, gives this 160-acre ranch its name. We arrived around 11 a.m. on Sunday, October 14th. About 100 yards into the 3/4-mile gravel drive, Gary took a sharp, narrow turn. The truck made it fine, but the trailer hung with two wheels in the air over the culvert. I wanted to take a picture, but unloading the trailer and trying to keep it from tipping into the ditch seemed more important at the time. As promised, our good friend and neighbor Harmon came along a couple of hours later with some propane to start us off. 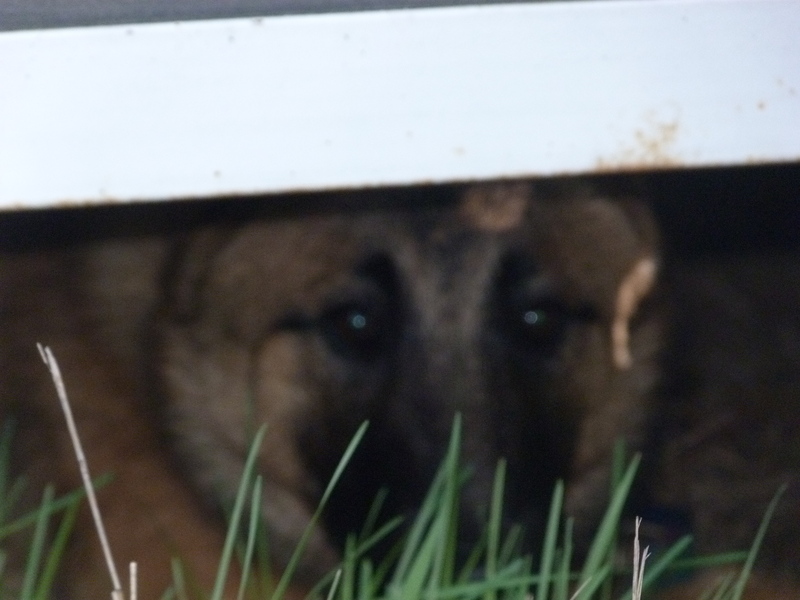 Eyeballing the situation, he fetched other neighbors, the Morrisons, and their giant forklift, which they used to gently set the trailer back on solid ground. We’re lucky, once again, to have such wonderful neighbors. View from the deck of our beautiful new home. Aunt Vee and Uncle Keith built this as their winter home here in the late 80’s; it sits above the urban fog, full of light and windows to take in the views. Though we’re only a half-hour from Medford or Ashland, we can’t see a single light from the property; we look up at the night sky and imagine ourselves back at our cabin. But the wildlife is different, their night calls new to us. Ella is learning about deer and turkeys and, yes, skunks. She got away easy, but her face smelled pretty bad one night. After I examined her I didn’t smell too good either. Our days have been busy with all the things that settling in requires. 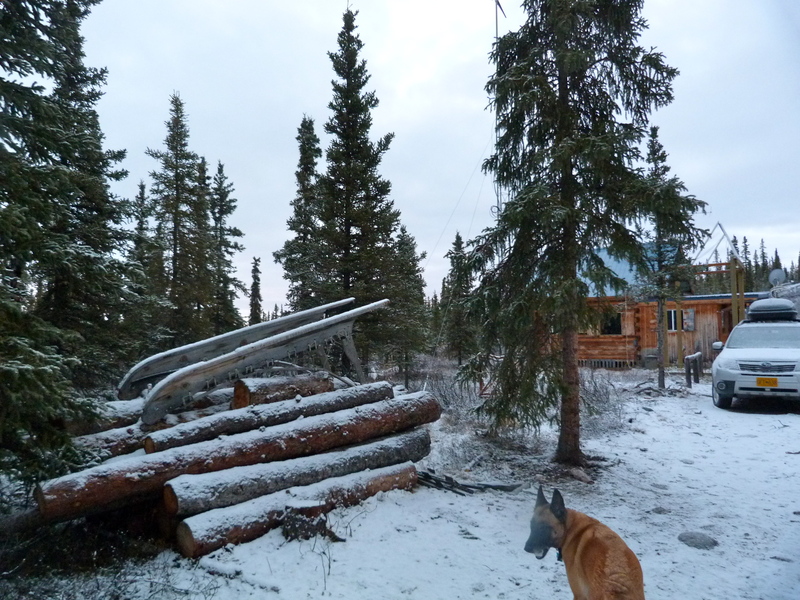 I hope to write a final piece or two for indeep (Alaska) before starting a new blog, indeep (Outside). (If the new name confuses you, check out the Alaskan glossary!) Our adventures will be of a different nature, to be sure. Now that I have a telephone and am within visiting range for many of you, the blog is no longer a necessity for staying in touch. But it has come to be like writing letters home; I enjoy doing it, and I enjoy hearing back from you. What we’re reading: Invisible Man, H.G. Wells (Gary and Barbara); The Artist’s Way, Julia Cameron (Gary). indeep-alaska.com by Barbara Bailey is licensed under a Creative Commons Attribution-NonCommercial-NoDerivs 3.0 Unported License. Thank you for your visit and your support. I hope you enjoy my adventures as much as (or more than) I do!